Some Solar color pages . . . Solar #0 page 3. 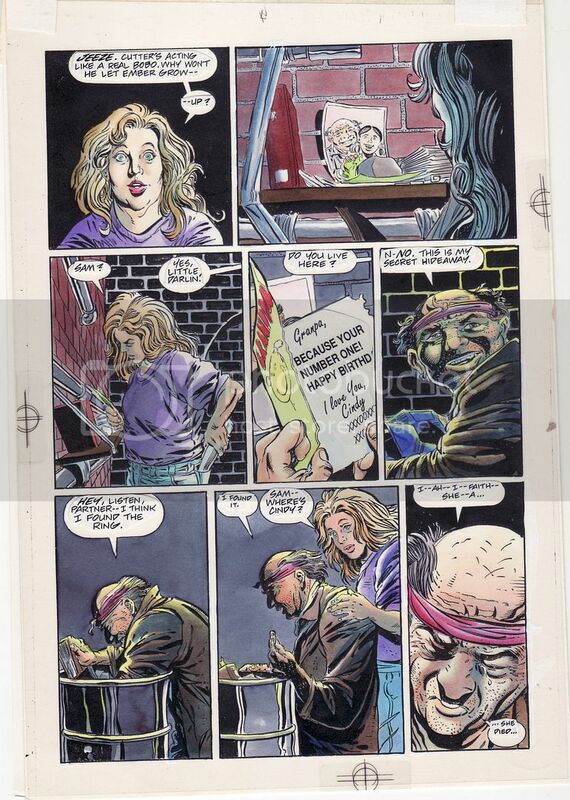 Pencilled by Barry Windsor-Smith, inked by Bob Layton, and colored by Janet Jackson. 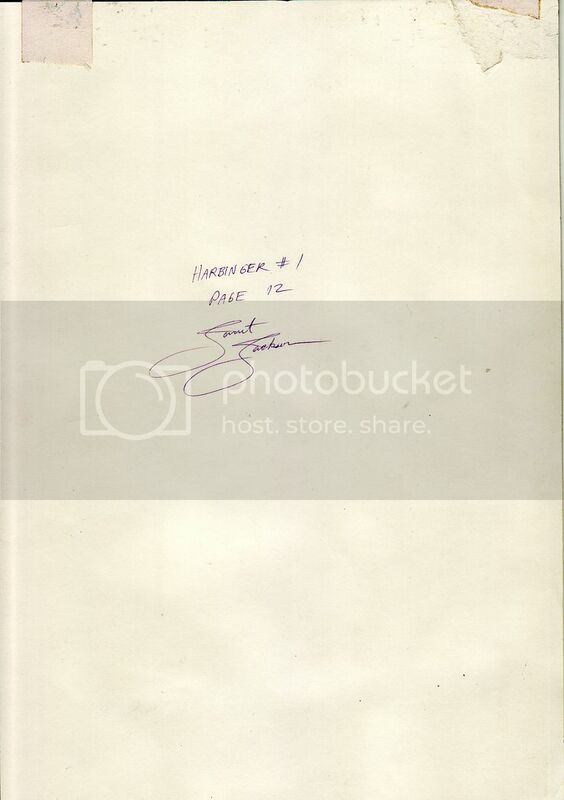 Signed by Janet Jackson and Bob Layton. Solar #0 page 15. 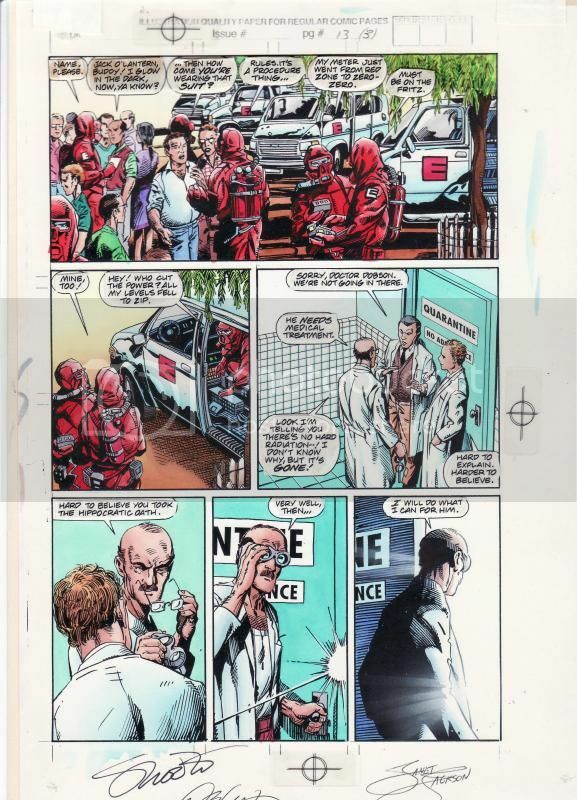 Pencilled by Barry Windsor-Smith, inked by Bob Layton, and colored by Janet Jackson. 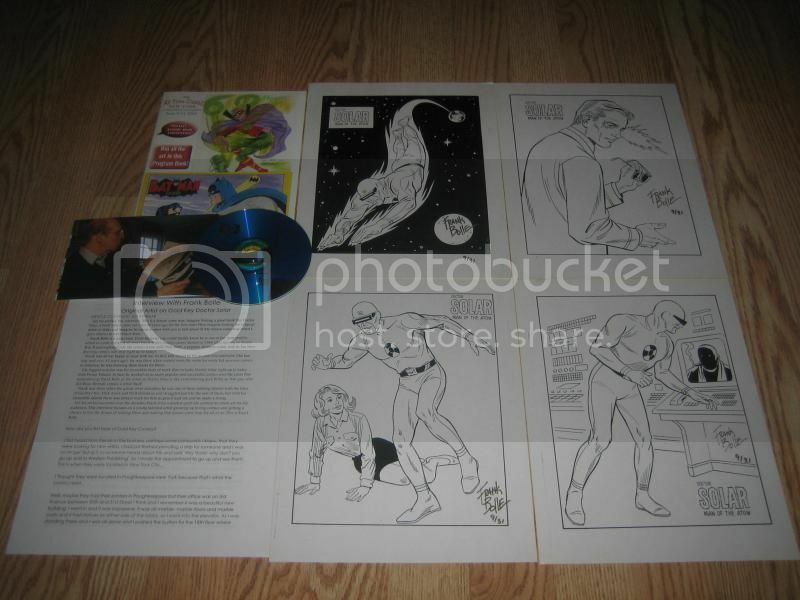 Signed by Janet Jackson, Bob Layton, and Jim Shooter. Solar #0 page 22. 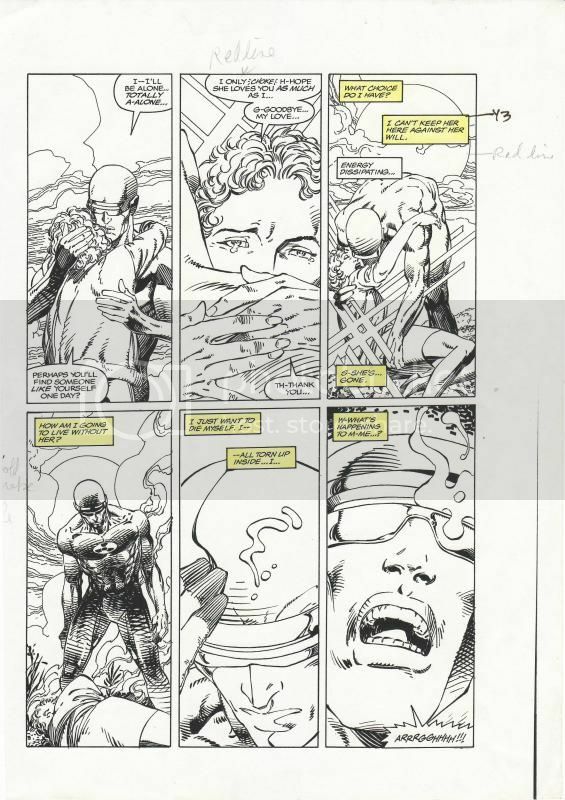 Pencilled by Barry Windsor-Smith, inked by Bob Layton, and colored by Janet Jackson. 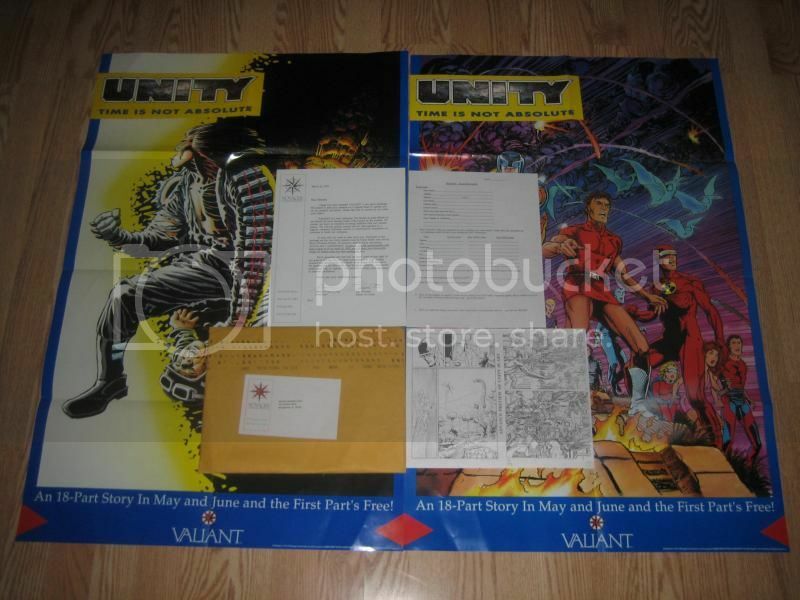 Signed by Janet Jackson and Bob Layton. Solar #0 page 25. 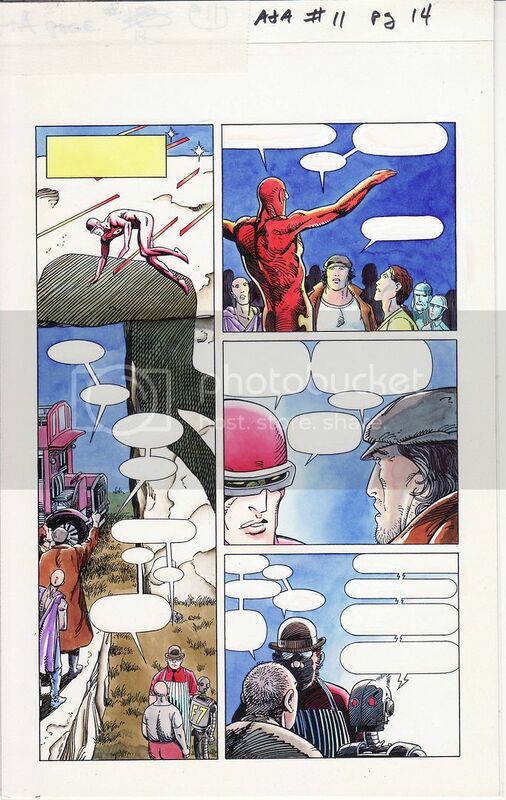 Pencilled by Barry Windsor-Smith, inked by Bob Layton, and colored by Janet Jackson. Signed by Bob Layton. 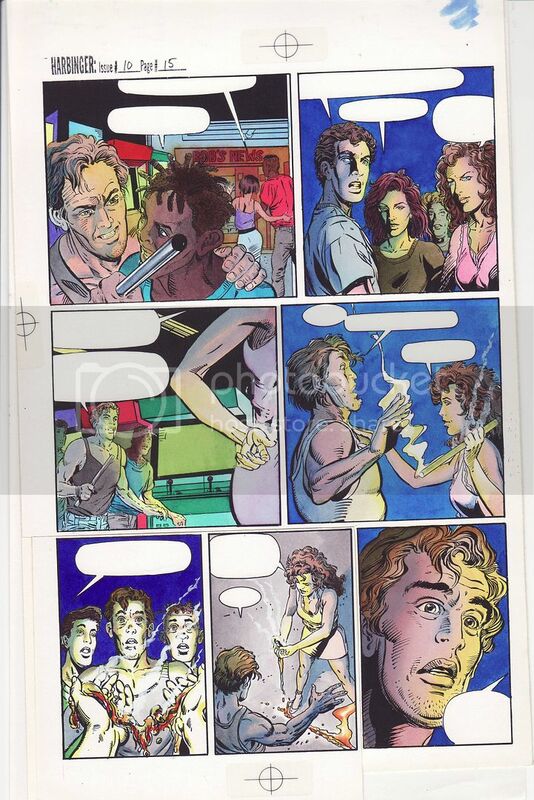 Some Deathmate color pages . . .
Deathmate Prologue page 1. 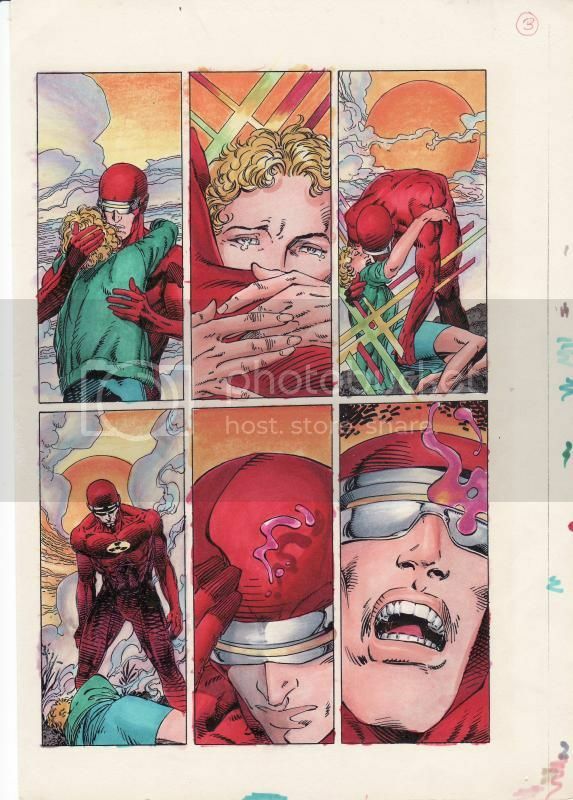 Pencilled by Barry Windsor-Smith, inked by Jim Lee, and colored by Joe Chiodo. Deathmate Prologue page 2. 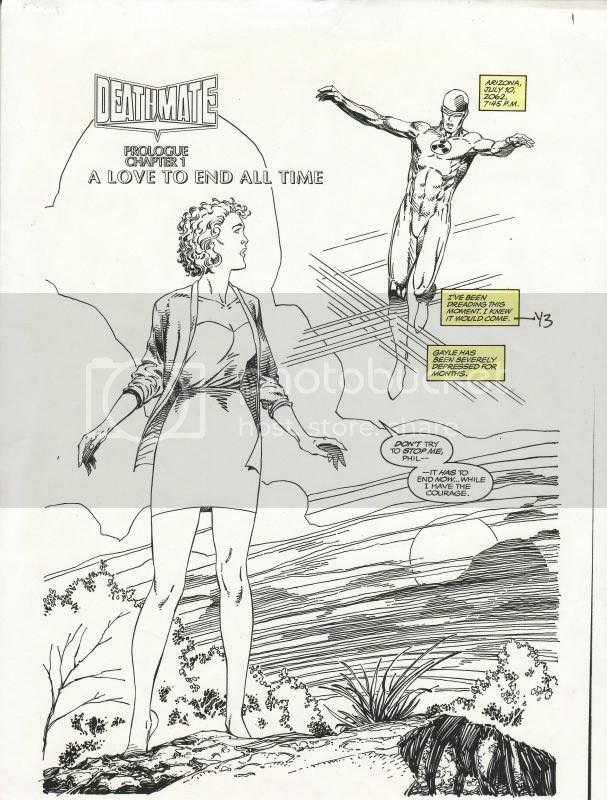 Pencilled by Barry Windsor-Smith, inked by Jim Lee, and colored by Joe Chiodo. Deathmate Prologue page 3. 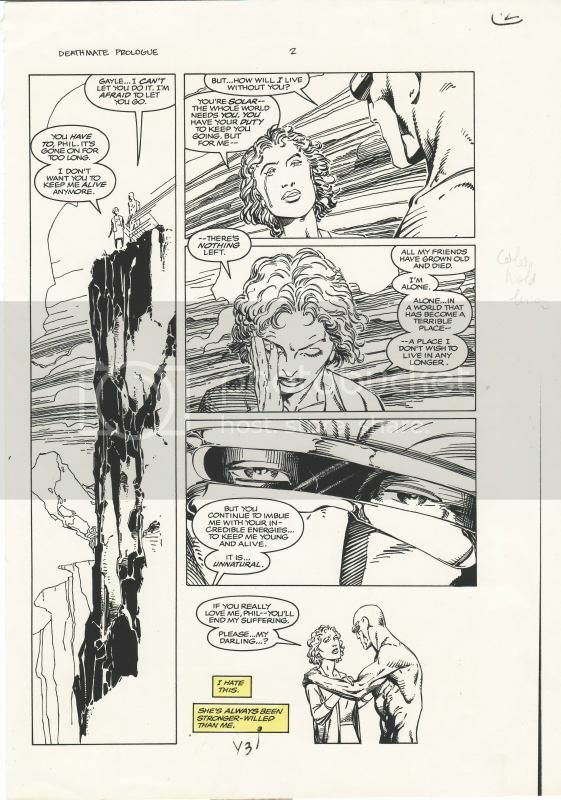 Pencilled by Barry Windsor-Smith, inked by Jim Lee, and colored by Joe Chiodo. 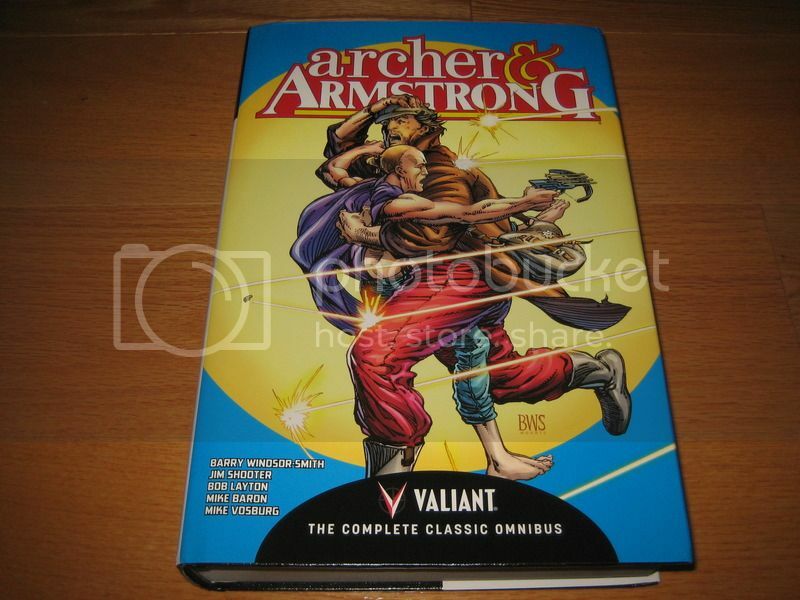 Some Archer & Armstrong color pages . . .
Archer & Armstrong #2 page 7. 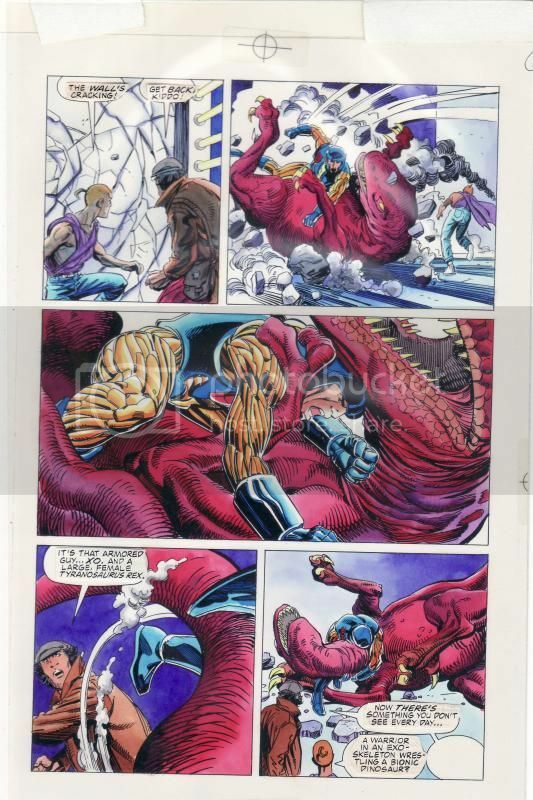 Pencilled by Barry Windsor-Smith, inked by Bob Layton, and colored by Maurice Fontenot. Archer & Armstrong #2 page 8. 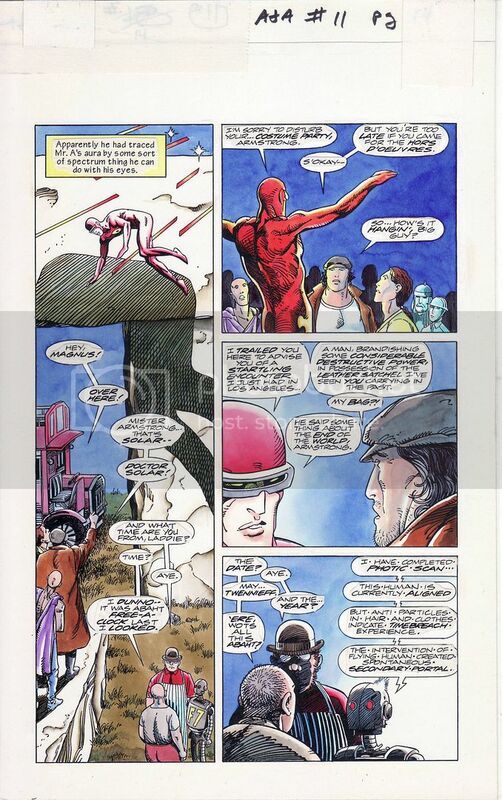 Pencilled by Barry Windsor-Smith, inked by Bob Layton, and colored by Maurice Fontenot. Last edited by iggy101us on Thu Sep 08, 2016 11:11:00 pm, edited 1 time in total. Harbinger color page . . .
Harbinger #4 page 11. 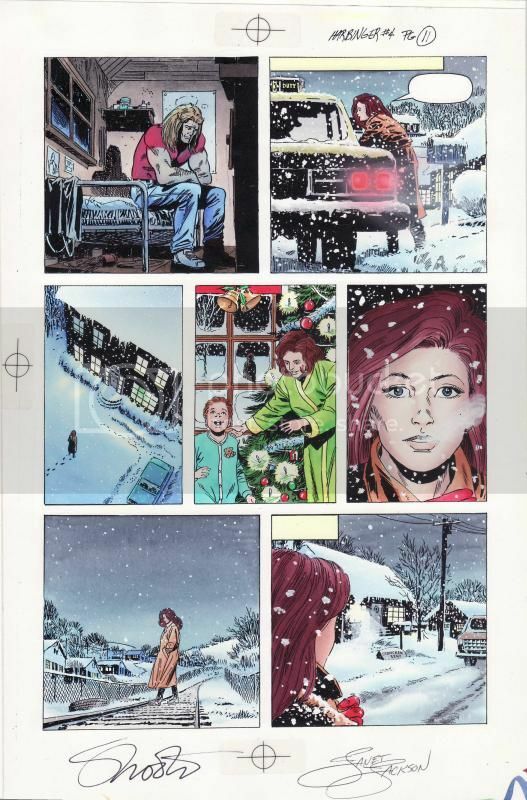 Pencilled by David Lapham, inked by John Dixon, and colored by Janet Jackson. 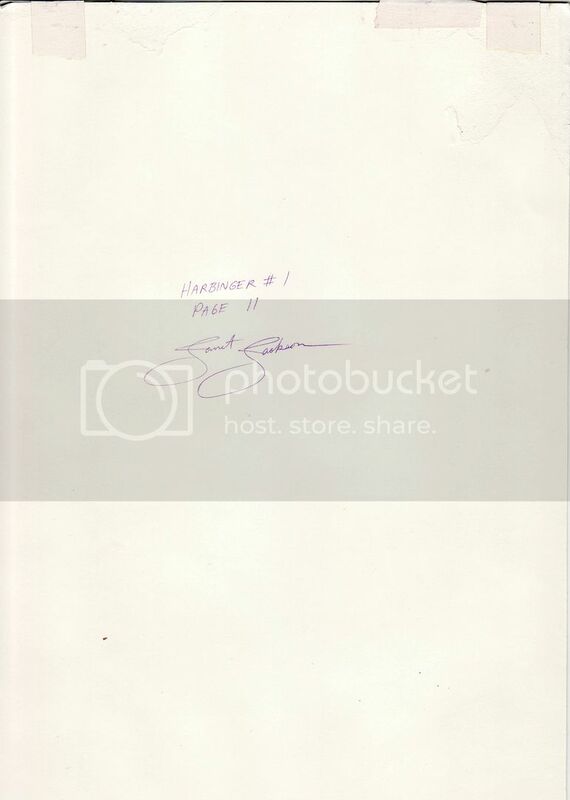 Signed by Janet Jackson and Jim Shooter. The matching inks . . .
Harbinger #4 page 11. 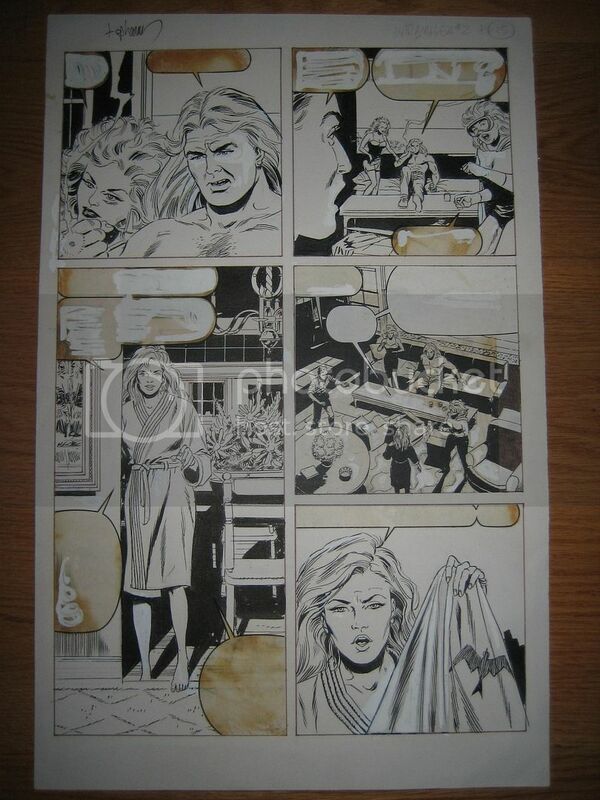 Pencilled by David Lapham, inked by John Dixon. 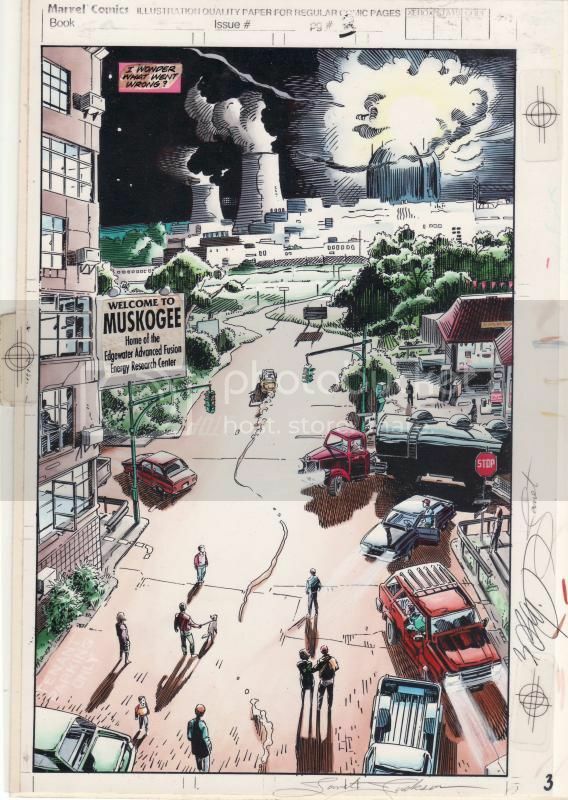 Signed by David Lapham. Last edited by iggy101us on Thu Sep 08, 2016 11:11:21 pm, edited 1 time in total. 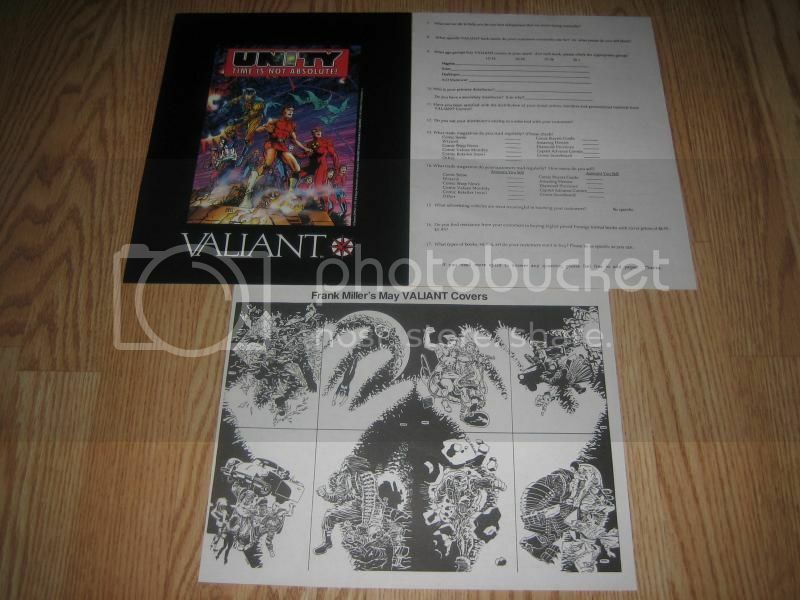 Retailer incentive uncut Valiant Era II X-O LE1 sheet. 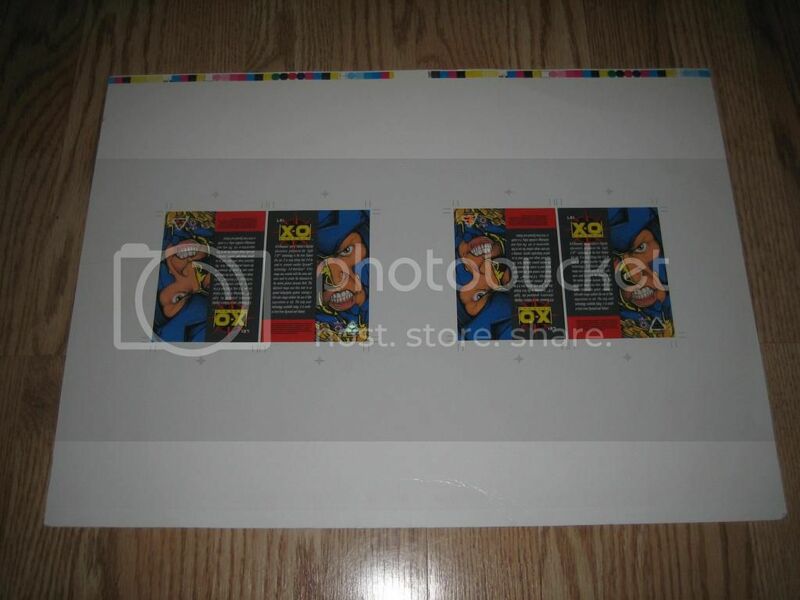 It was given out the retailers in 1994 and measures about 12.5” x 17.75”. 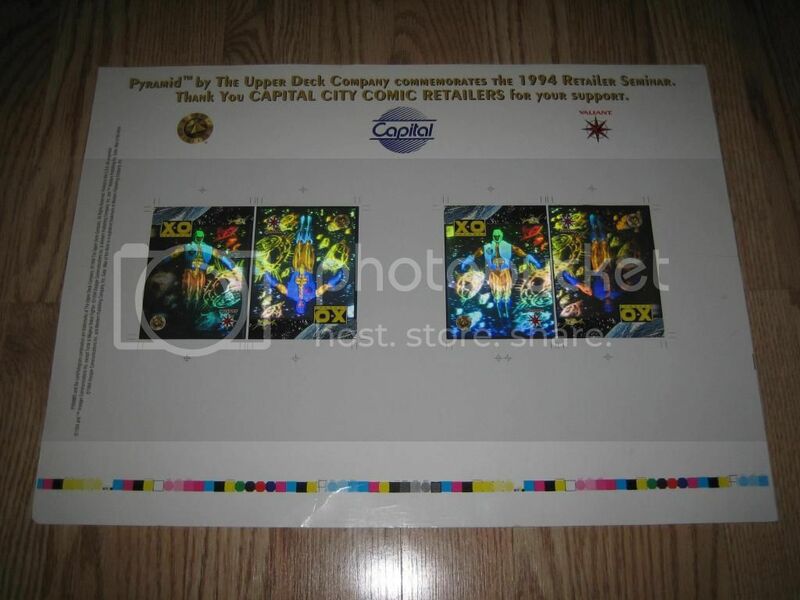 It reads “Pyramid by The Upper Deck Company commenorates the 1994 Retailer Seminar. 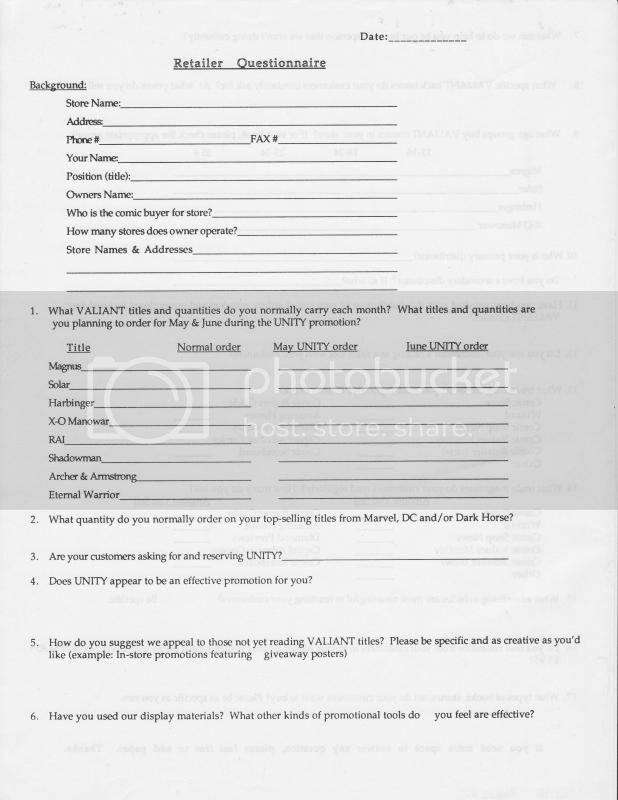 Thank You CAPITAL CITY COMIC RETAILERS for your support." 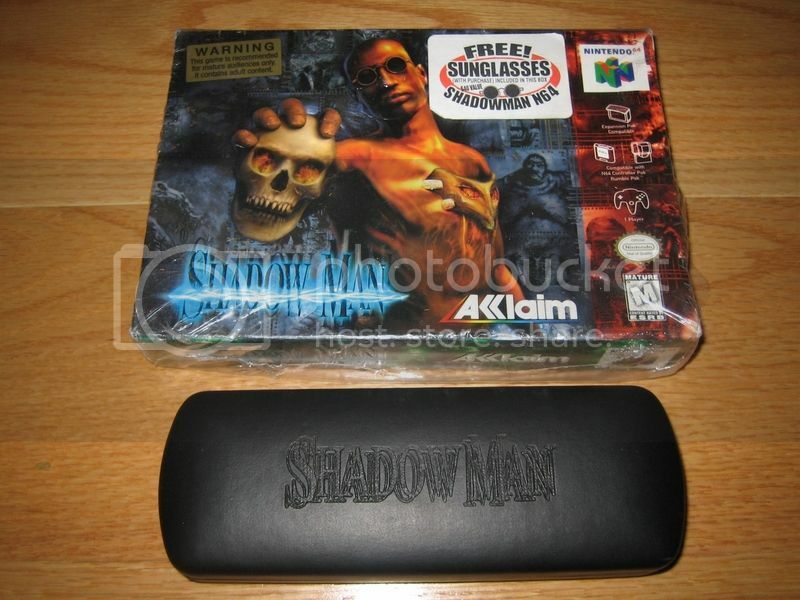 Nintendo 64 Shadowman game with sunglasses. 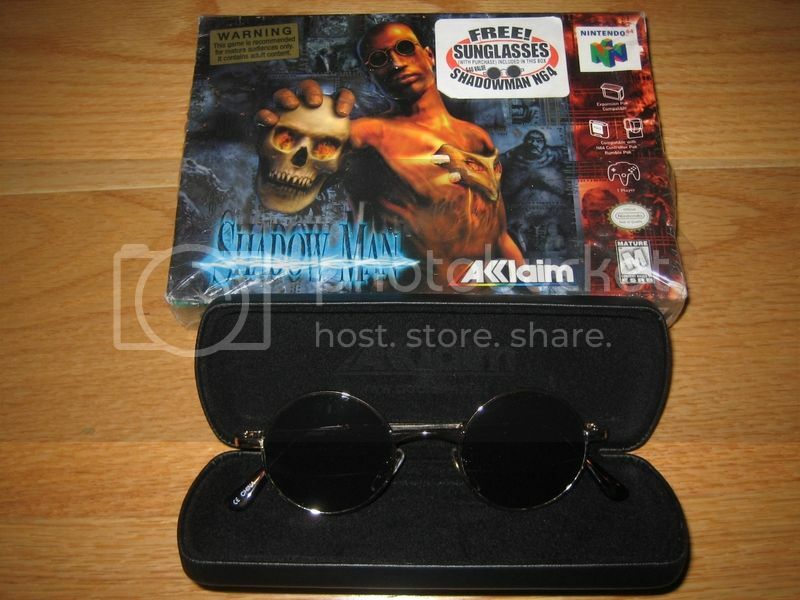 Acclaim Shadowman video game promo chrome sunglasses. 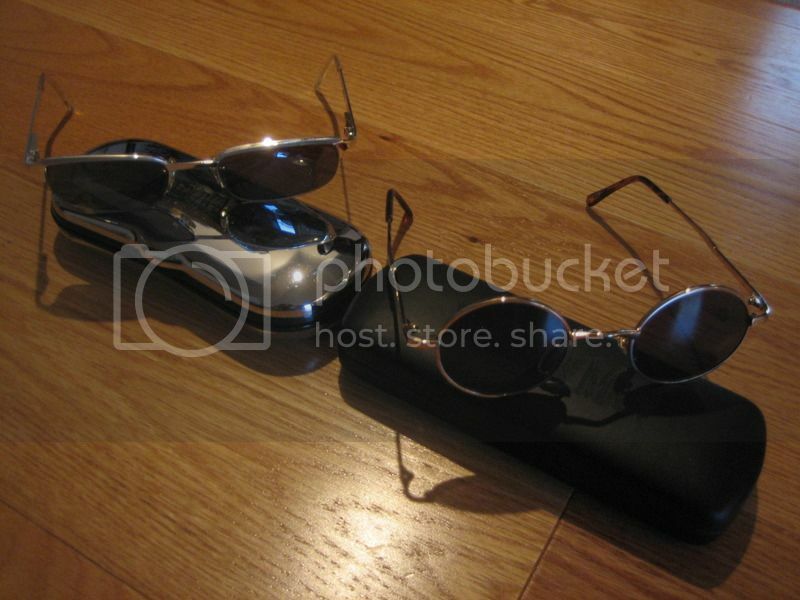 Acclaim Shadowman video game promo chrome and black sunglasses. Last edited by iggy101us on Fri Oct 16, 2015 9:54:38 pm, edited 1 time in total. 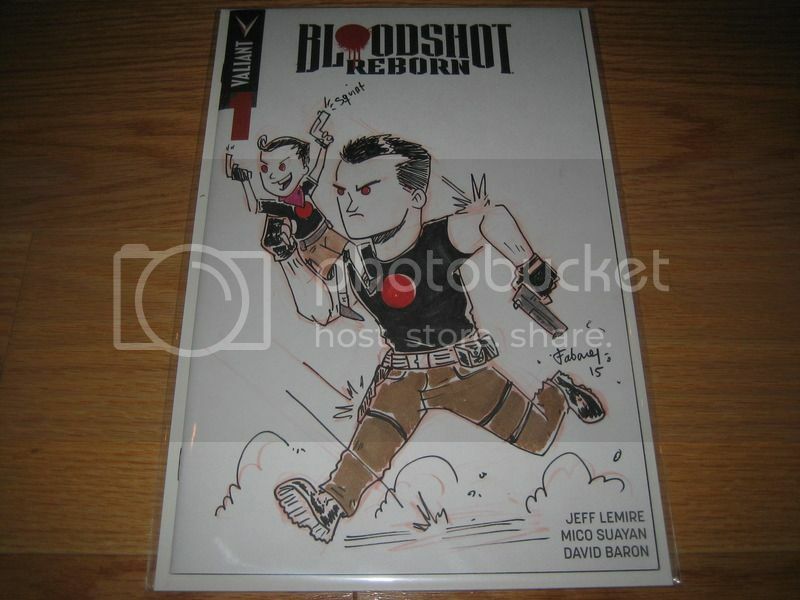 Sketch of Bloodshot by Jay Fabares on 8/8/2015 at StocktonCon. 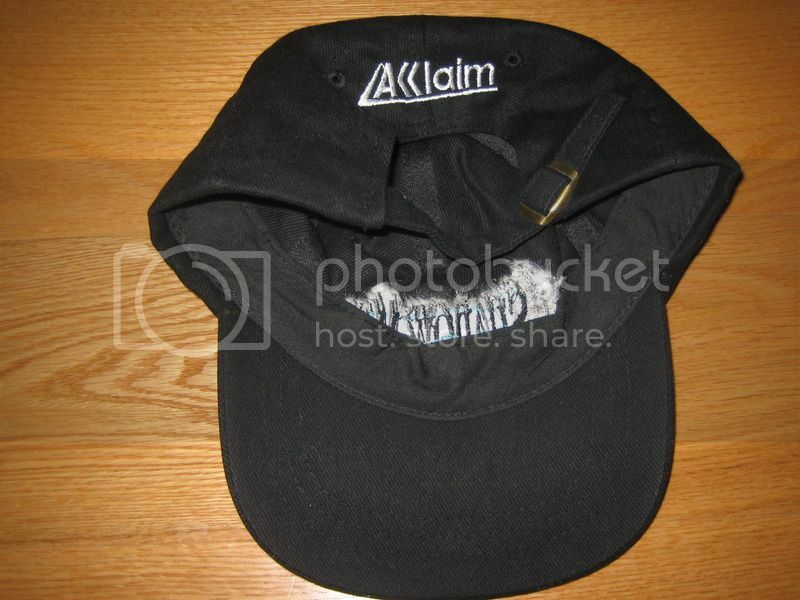 Acclaim Shadowman baseball cap with adjustable buckle and snap closure. 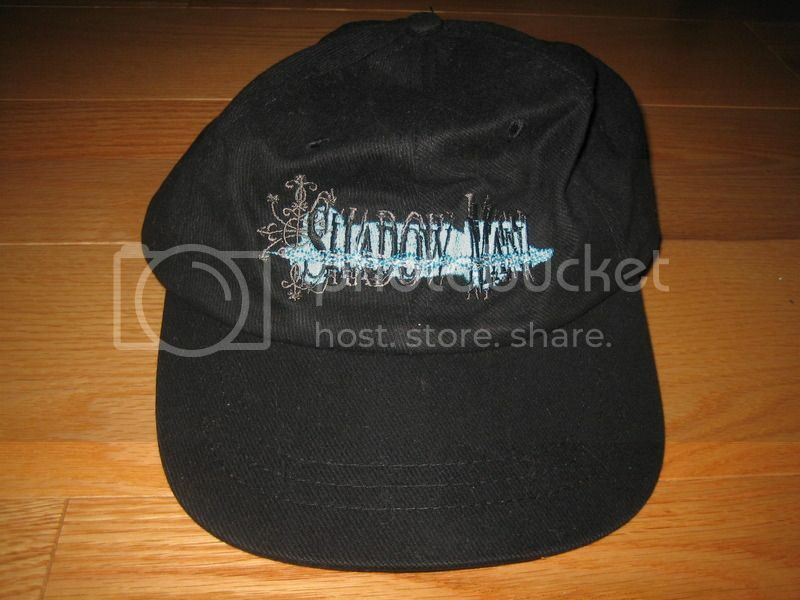 Embroidered with Shadow Man on front and Acclaim on back. 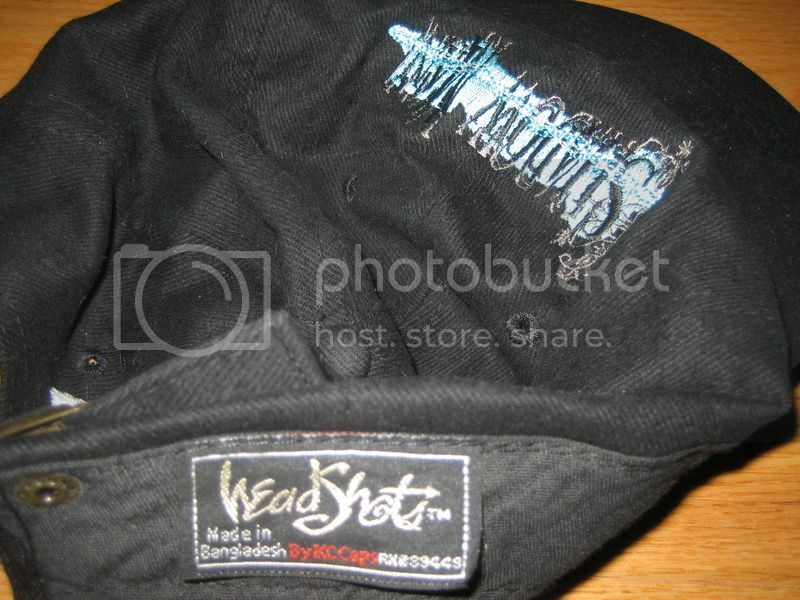 The tag says HeadShots by KC Caps. Made in Bangladesh. RN#89449 (H&C Headwear Inc. based in Carson, CA). 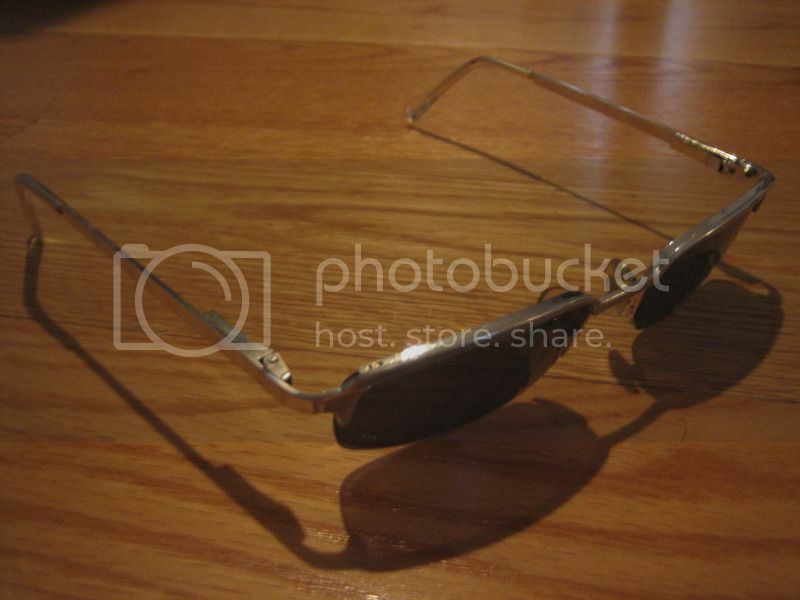 It looks great and it is in like-new condition. 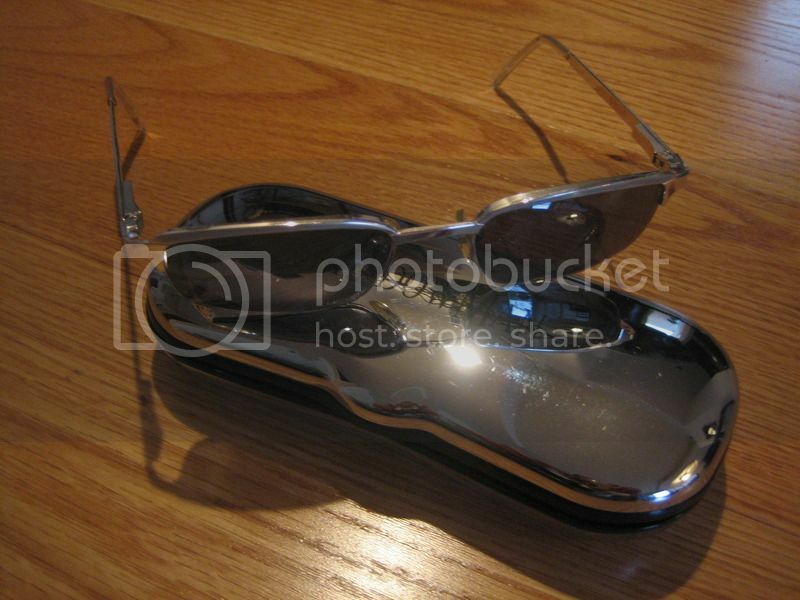 Does anyone have any info on this? 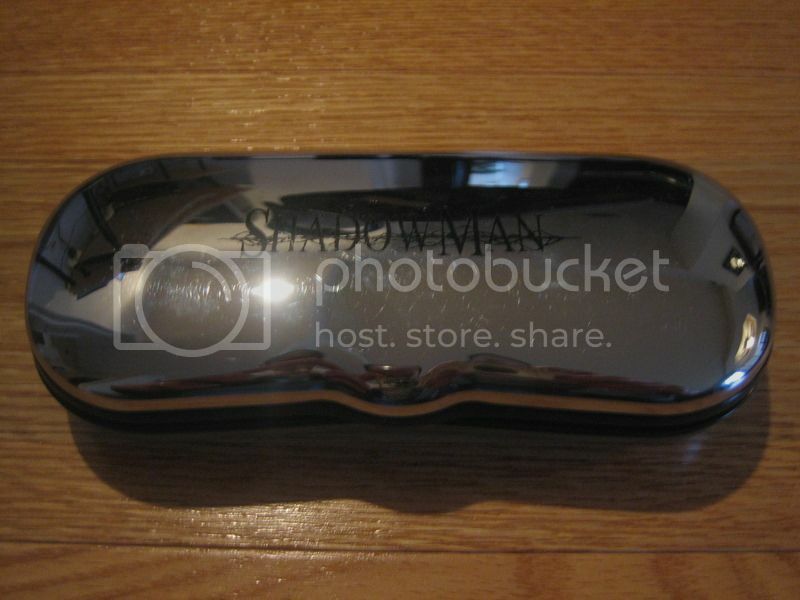 May be it's a prototype or promo item? 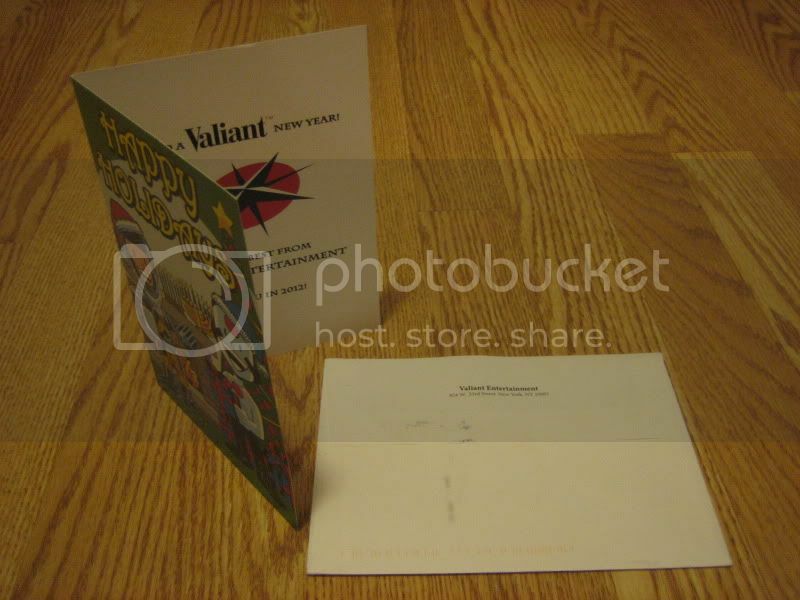 This was from the original owner who kept the VALIANT envelope postmarked in 1993. 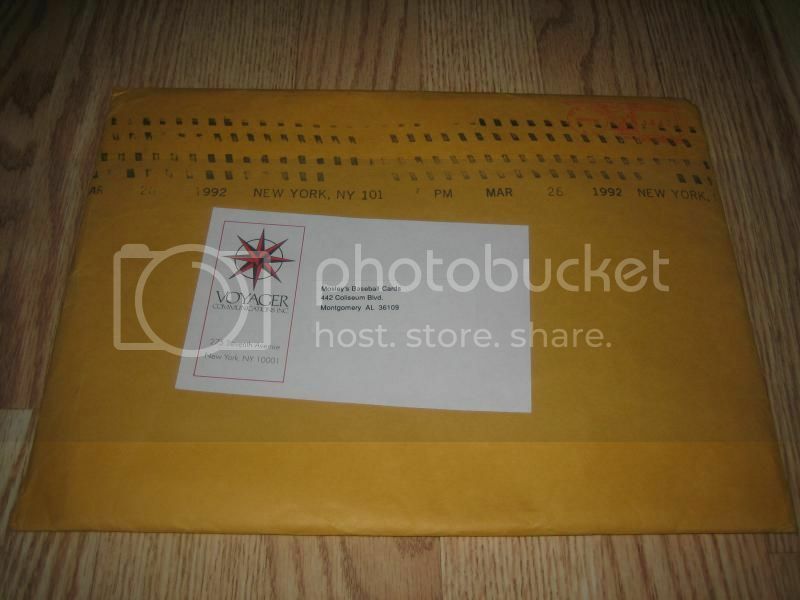 Postage for 1st class mail was $1.21. 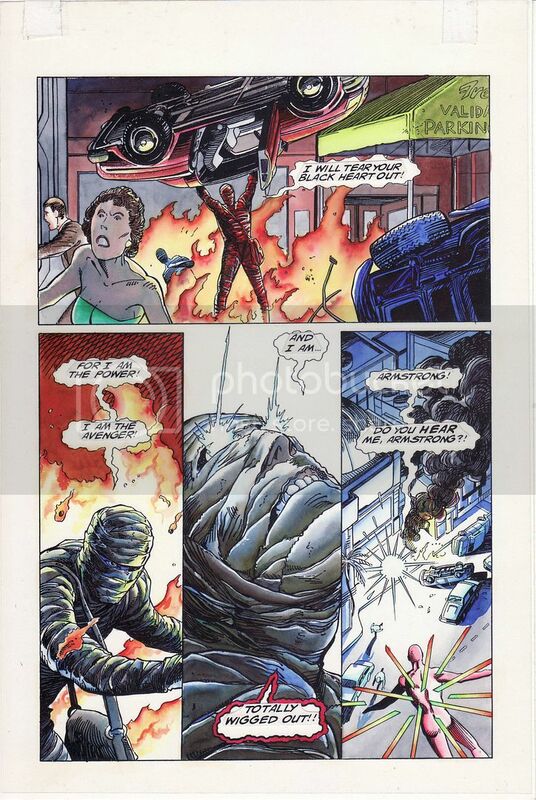 Ninjak #25 page 15. 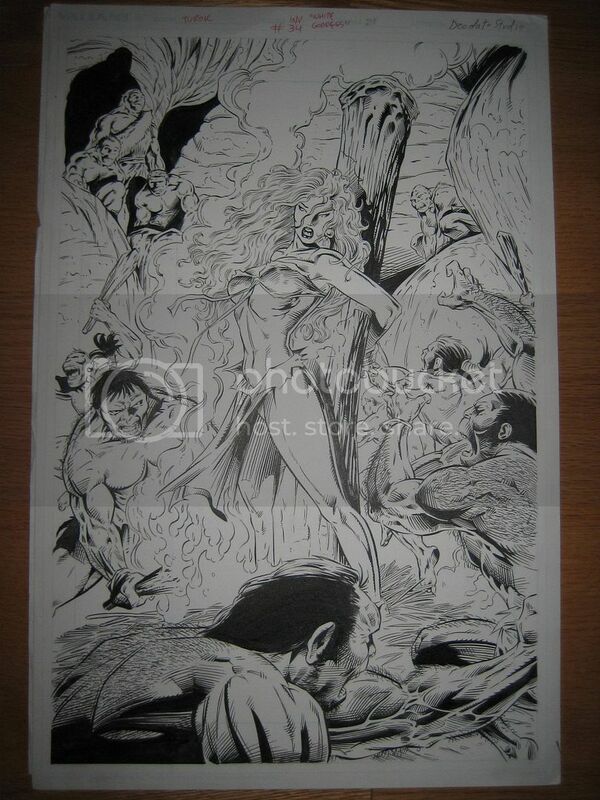 Pencilled by Mozart Couto, inked by Remmy Ribiero. Last edited by iggy101us on Thu Sep 08, 2016 11:10:33 pm, edited 1 time in total. 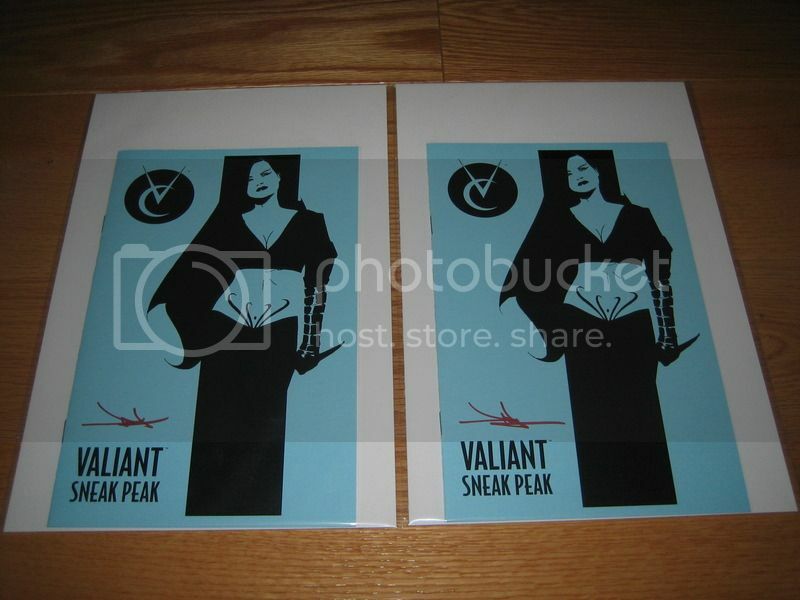 Valiant Sneak Peak signed by Jae Lee at StocktonCon on 8/20/2016. 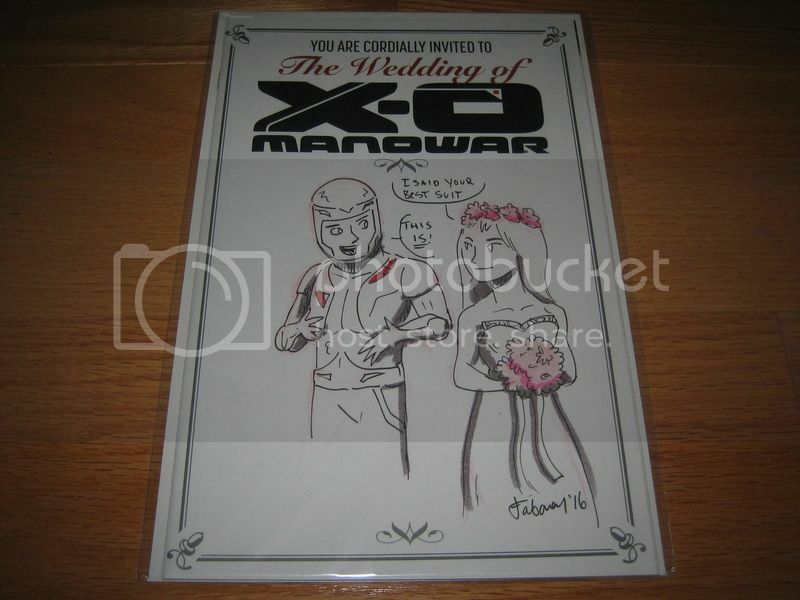 X-O Manowar sketch by Jay Fabares at StockonCon on 8/20/2016. 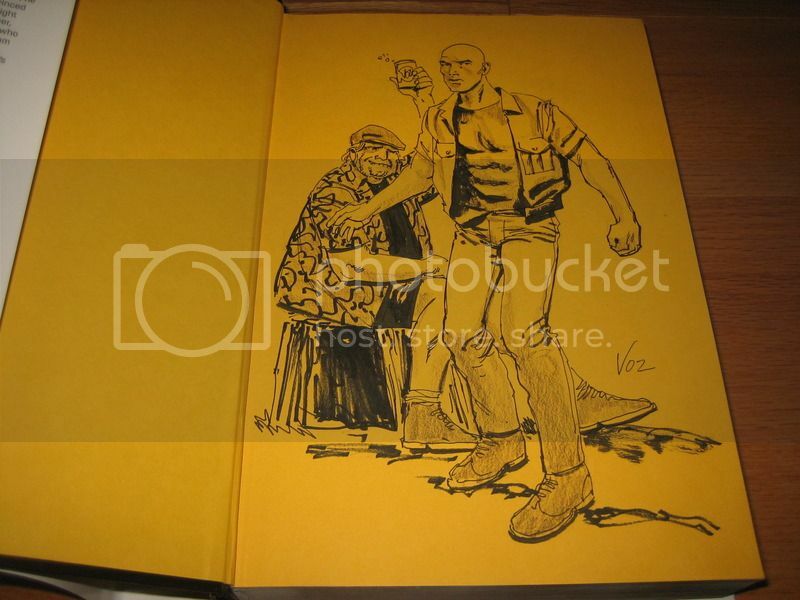 Archer & Armstrong Omnibus sketch by Mike Vosburg at StocktonCon on 8/20/2016. 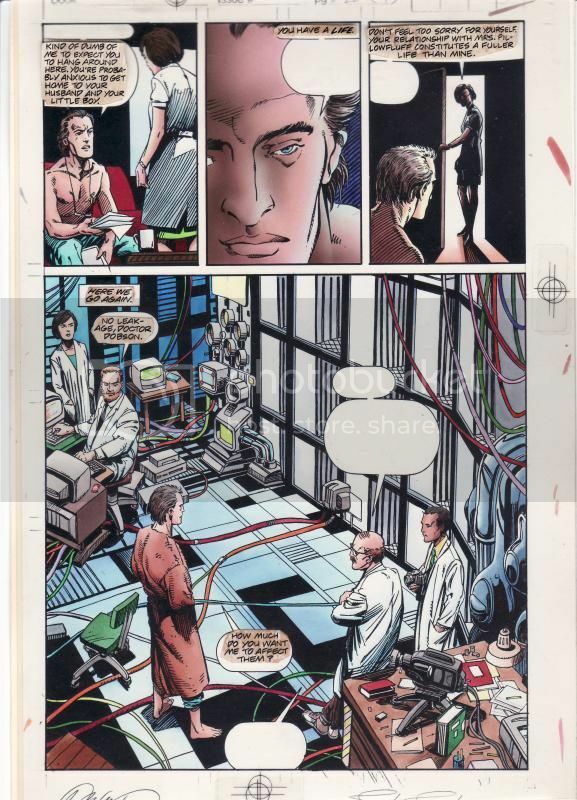 Harbinger #2 page 11. 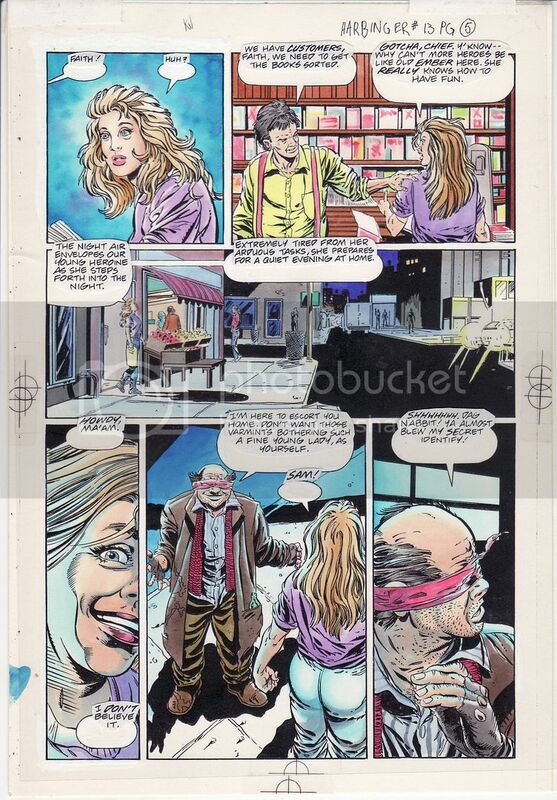 Pencilled by David Lapham, inked by John Dixon. Signed by David Lapham. 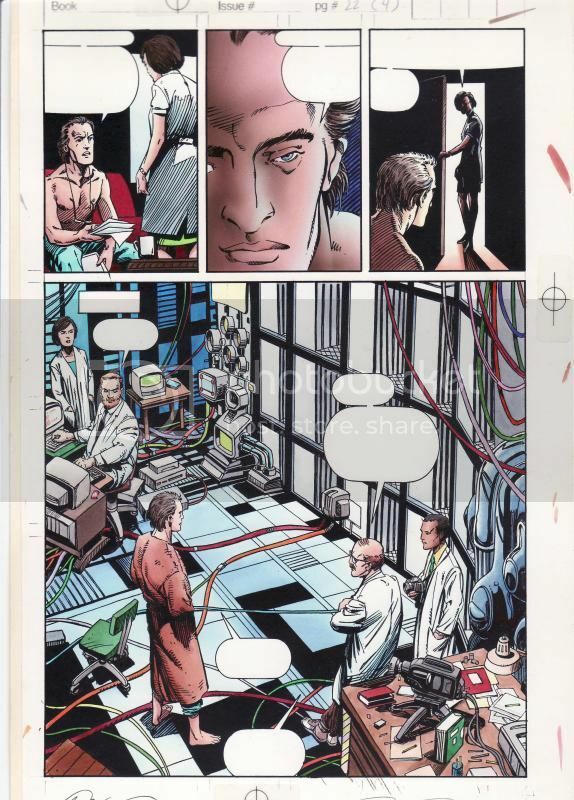 Harbinger #2 page 15. 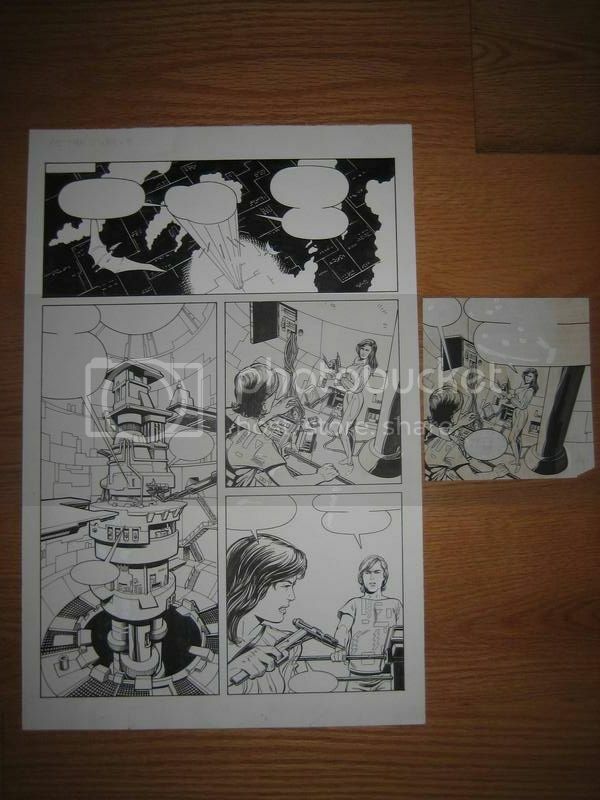 Pencilled by David Lapham, inked by John Dixon. Signed by David Lapham. 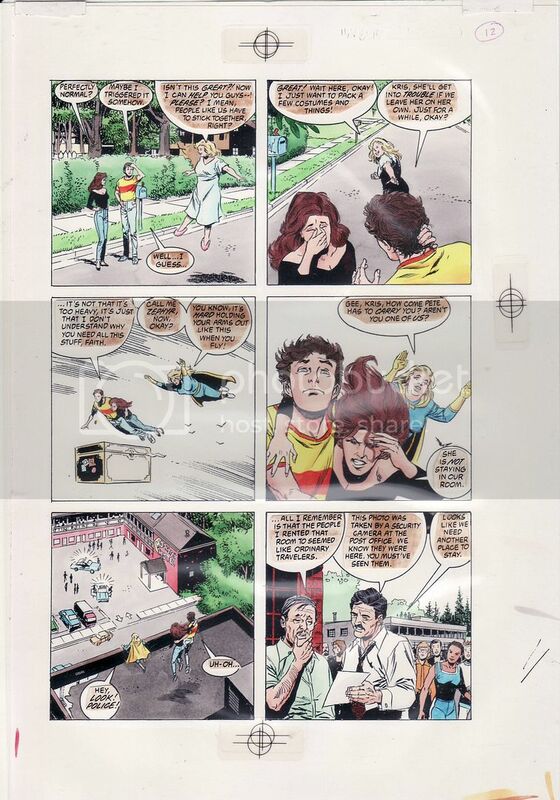 Harbinger #3 page 7. 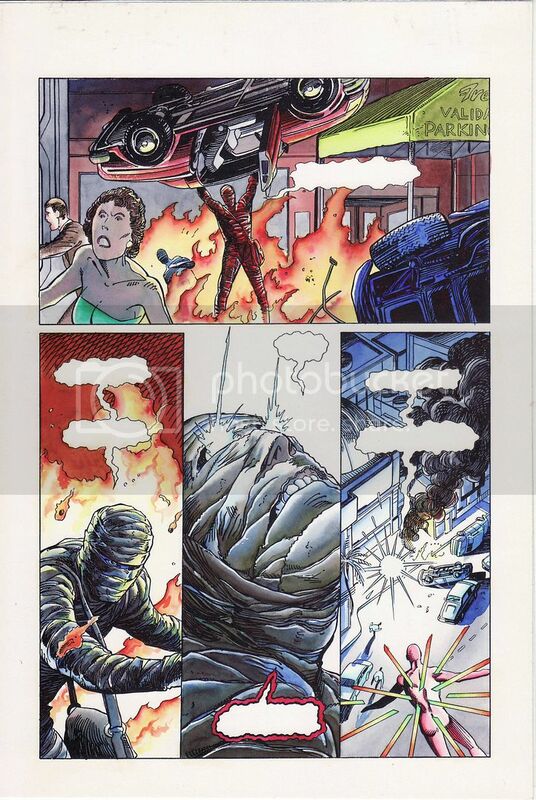 Pencilled by David Lapham. Signed by David Lapham. 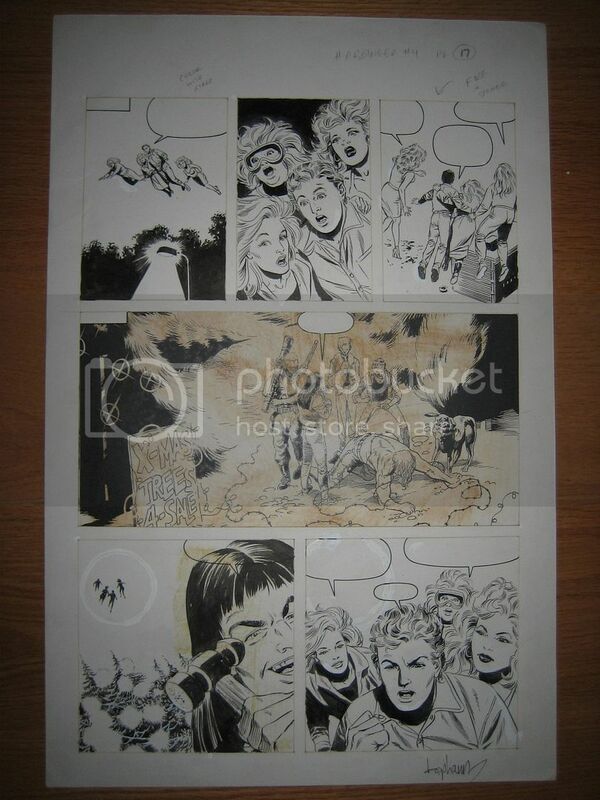 Per David Lapham in Nov 2007: "This is an un-inked page from the issue. I'm honestly not sure why they weren't inked over. 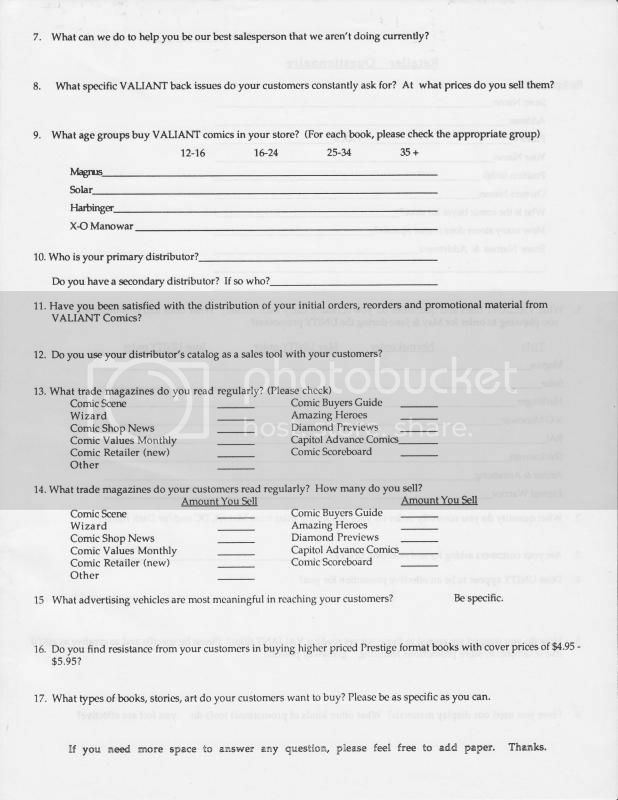 Perhaps because of deadline the image was faxed to John Dixon who light-boxed them. 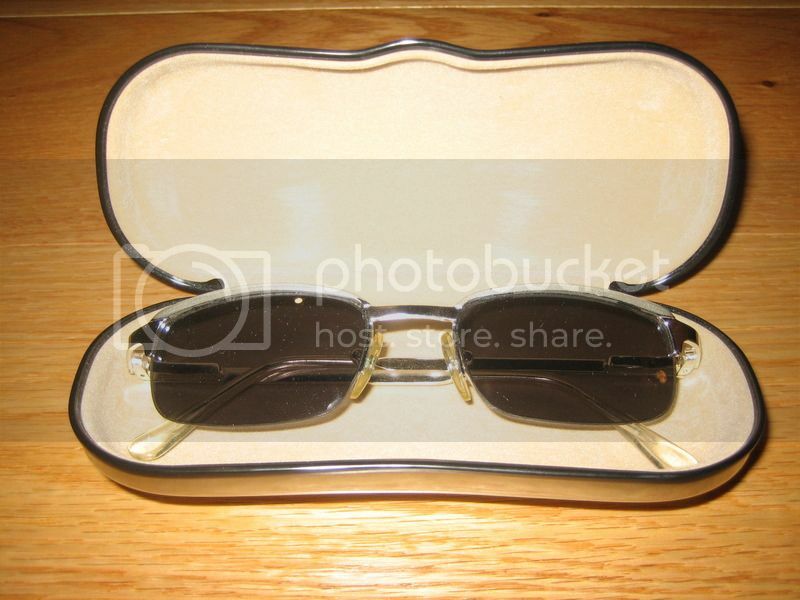 Or perhaps I light-boxed them and redrew them for some reason. I was such a newbie then. 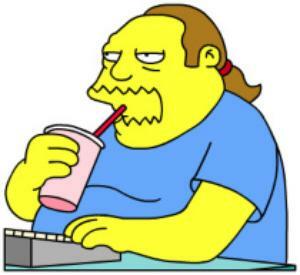 Still they are the same as the printed page and I have them, so...there you go." 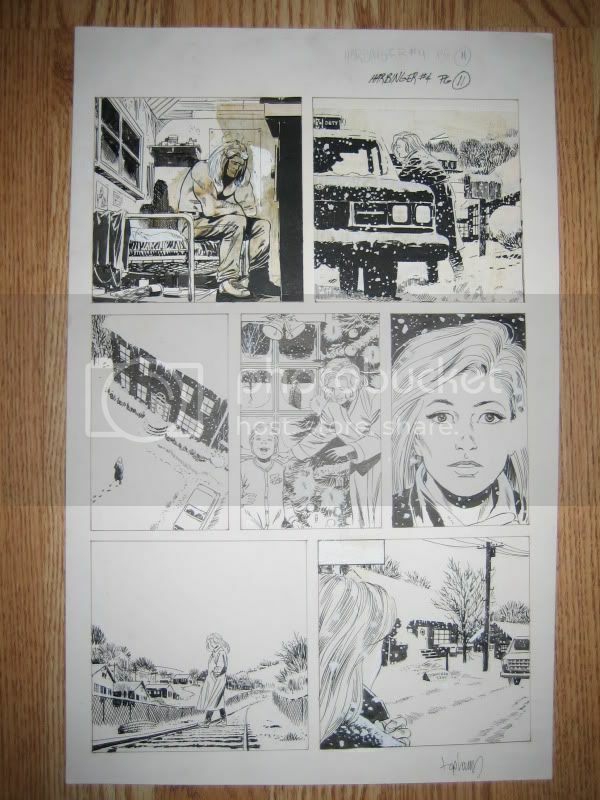 Harbinger #3 page 9. 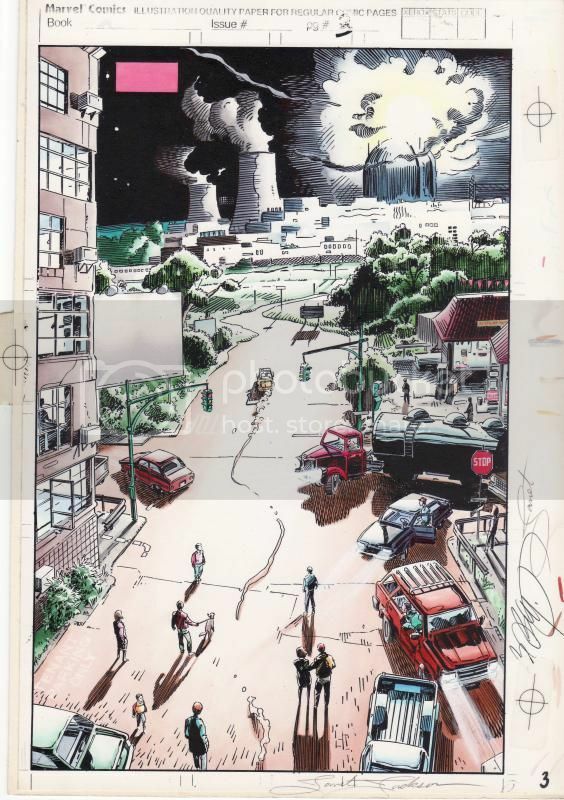 Pencilled by David Lapham. Signed by David Lapham. 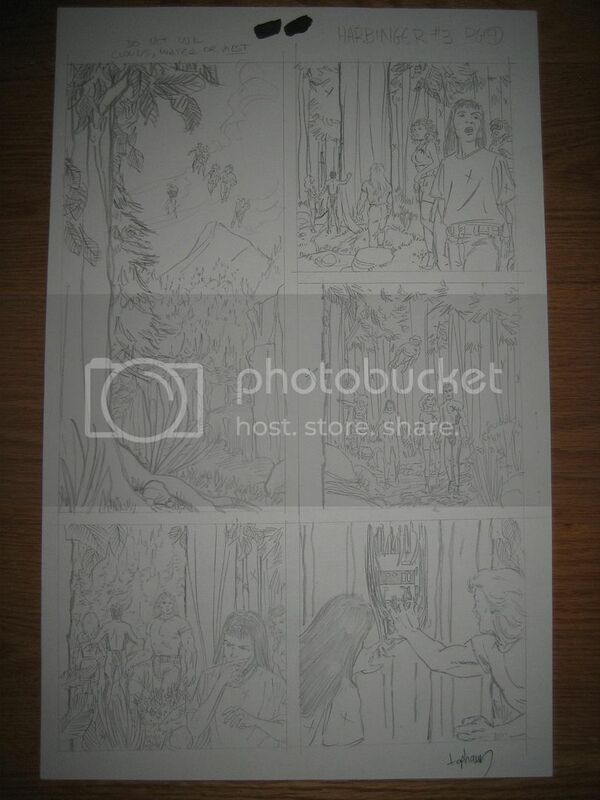 Per David Lapham in Nov 2007: "This is an un-inked page from the issue. I'm honestly not sure why they weren't inked over. 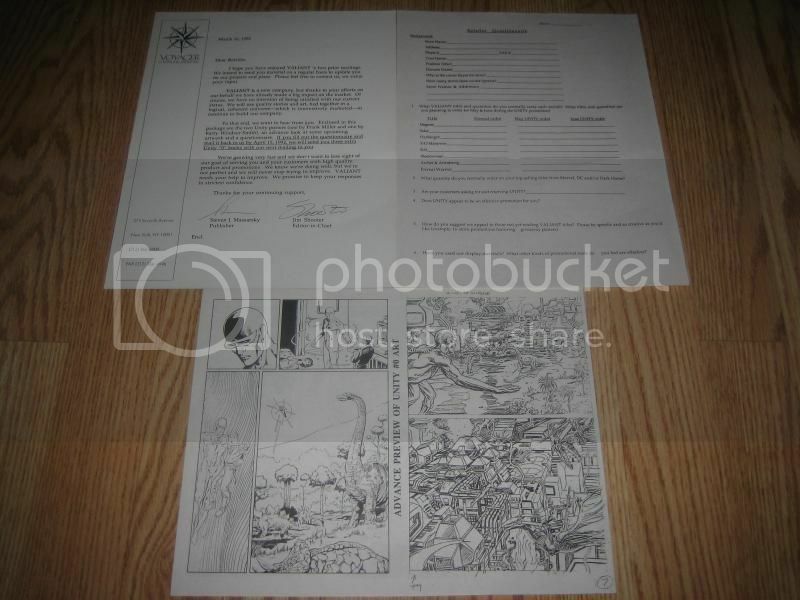 Perhaps because of deadline the image was faxed to John Dixon who light-boxed them. Or perhaps I light-boxed them and redrew them for some reason. I was such a newbie then. 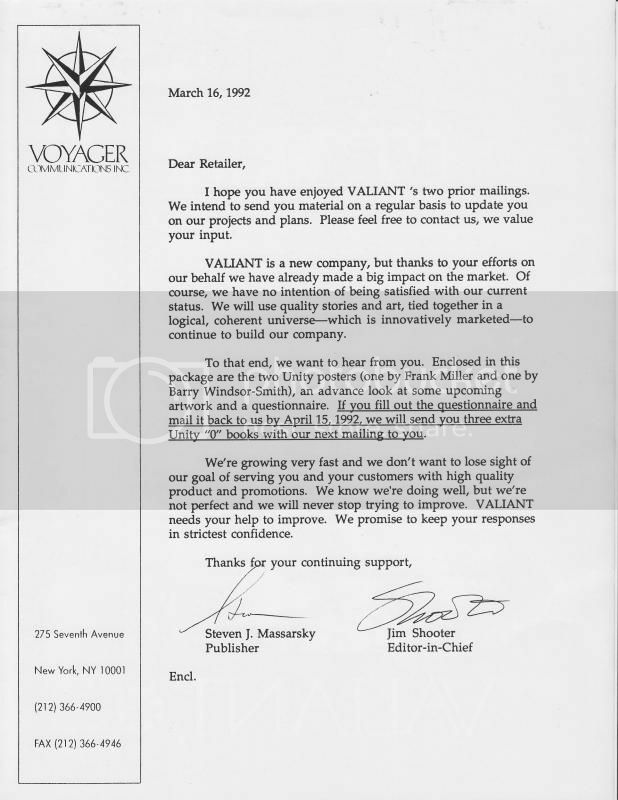 Still they are the same as the printed page and I have them, so...there you go." 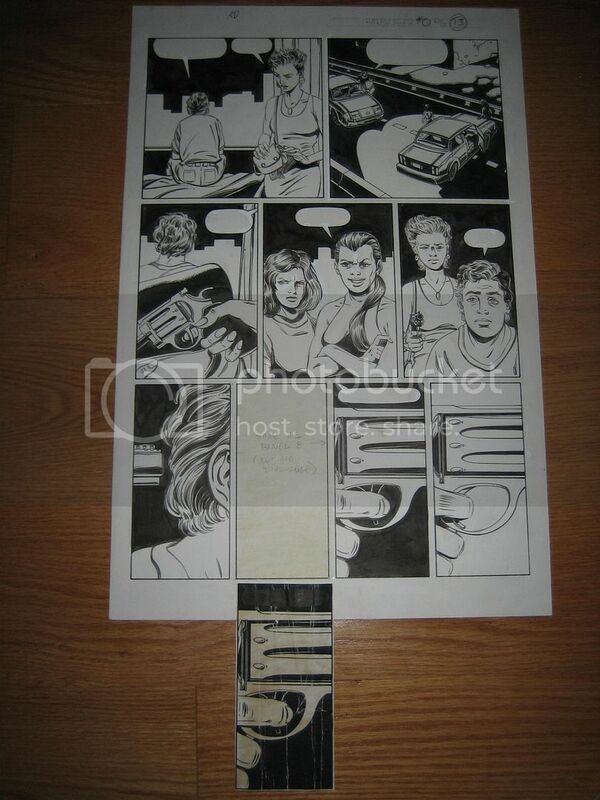 Harbinger #4 page 17. 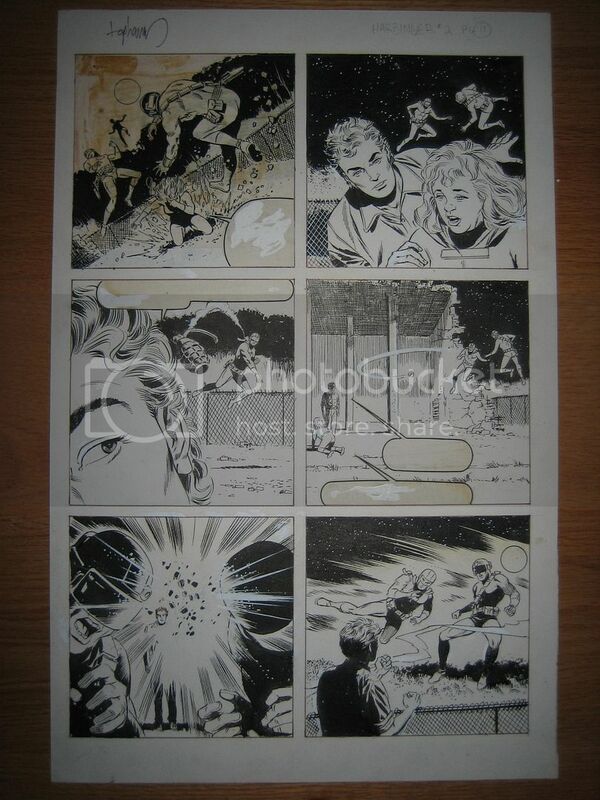 Pencilled by David Lapham, inked by John Dixon. Signed by David Lapham. 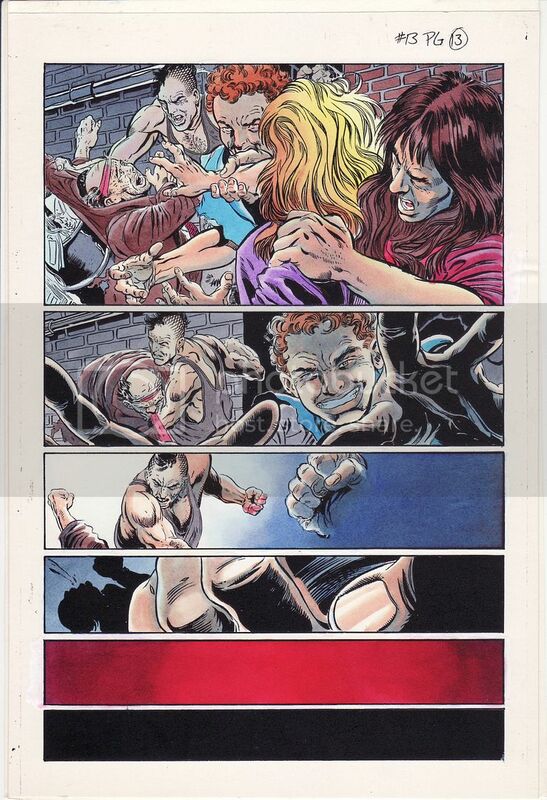 Harbinger #1 page 11 colors. 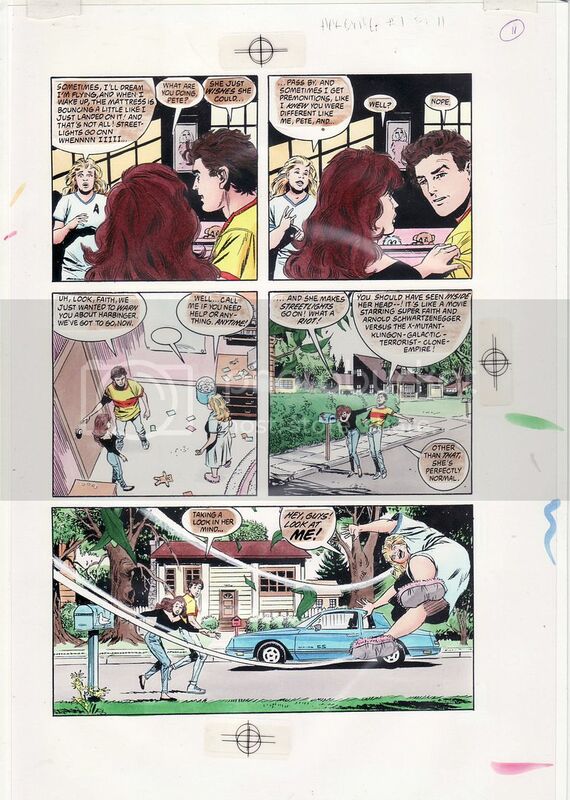 Pencilled by David Lapham, inked by John Dixon, colored by Janet Jackson. 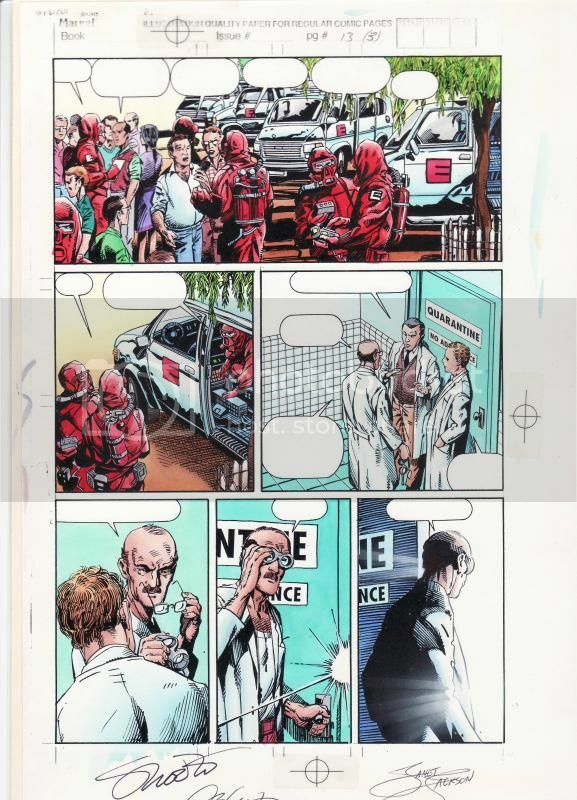 Harbinger #2 page 23 colors. 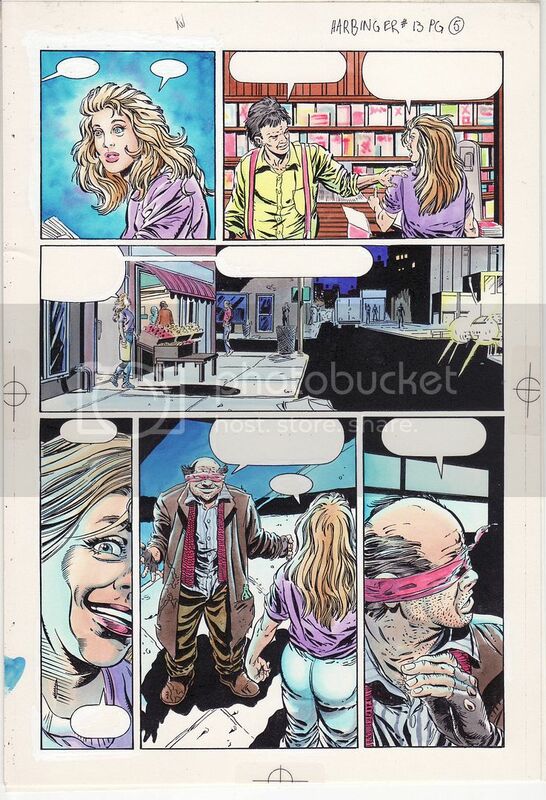 Pencilled by David Lapham, inked by Kathryn Bolinger, colored by Janet Jackson. Archer & Armstrong #11 page 7. 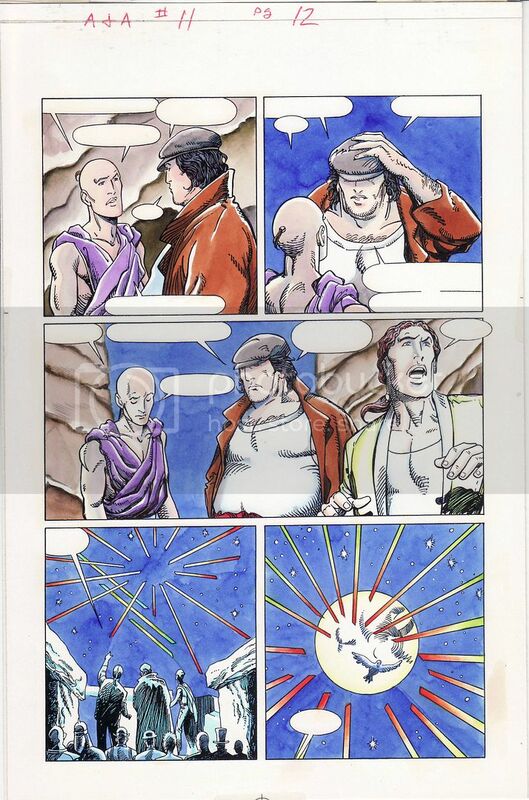 Pencilled by Barry Windsor-Smith, inked by John Floyd, and colored by Maurice Fontenot. Archer & Armstrong #11 page 12. 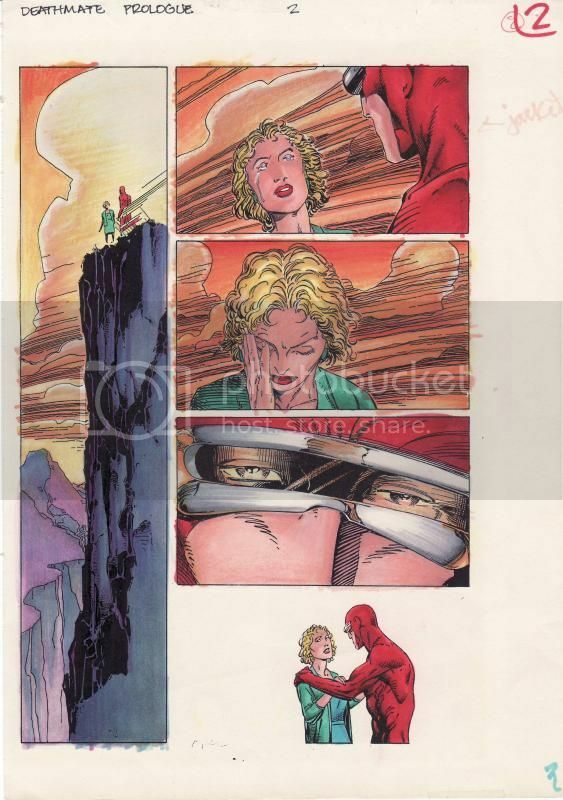 Pencilled by Barry Windsor-Smith, inked by John Floyd, and colored by Maurice Fontenot. Archer & Armstrong #11 page 14. 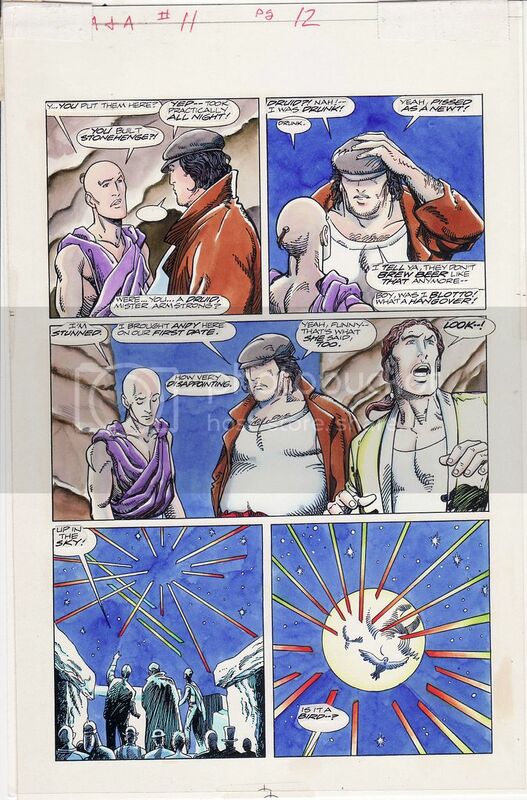 Pencilled by Barry Windsor-Smith, inked by John Floyd, and colored by Maurice Fontenot. 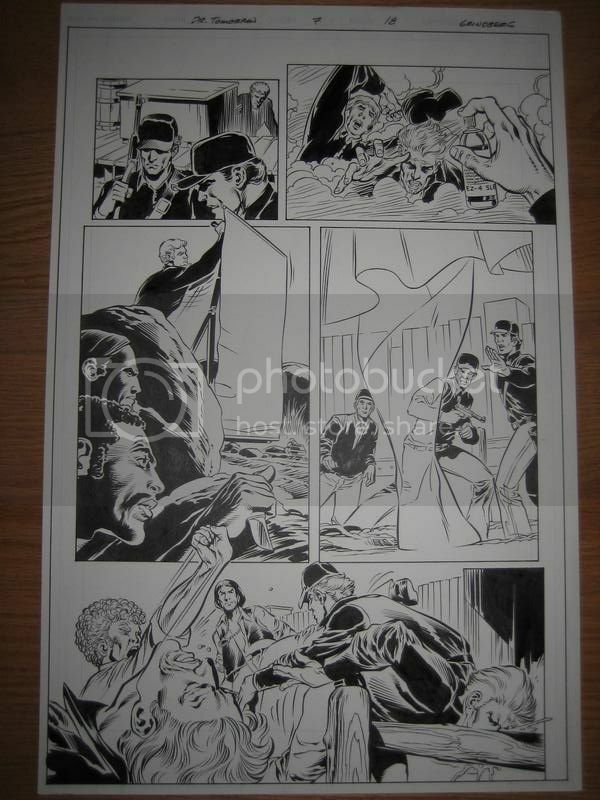 Harbinger #10 page 15. 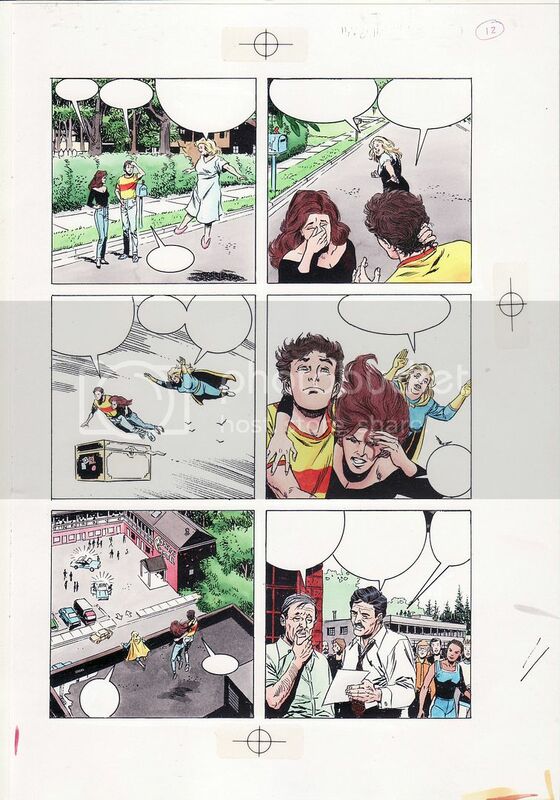 Pencilled by David Lapham, inked by Gonzalo Mayo, and colored by Maurice Fontenot. 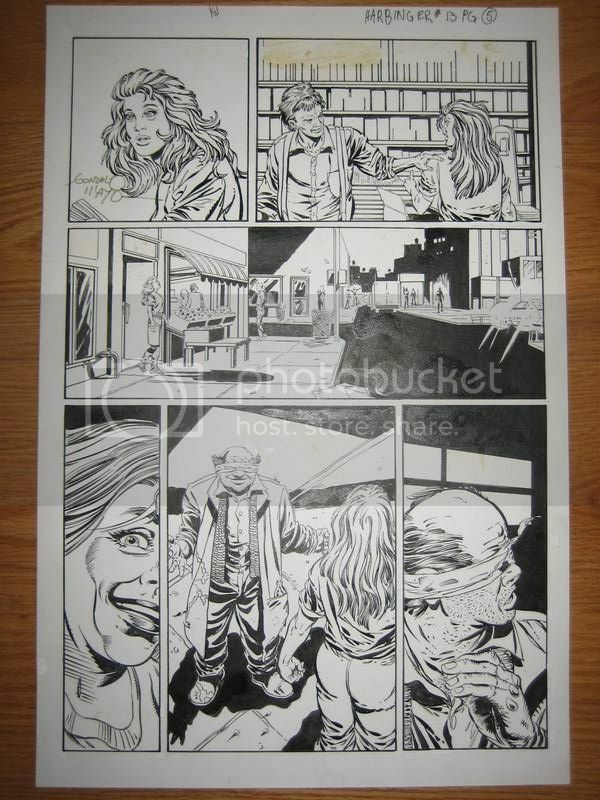 Harbinger #13 page 5. 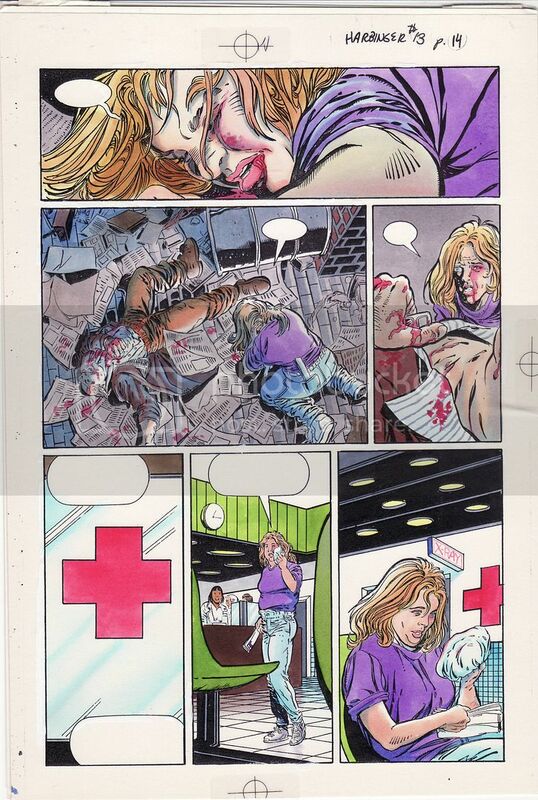 Pencilled by David Lapham, inked by Gonzalo Mayo, and colored by Maurice Fontenot. 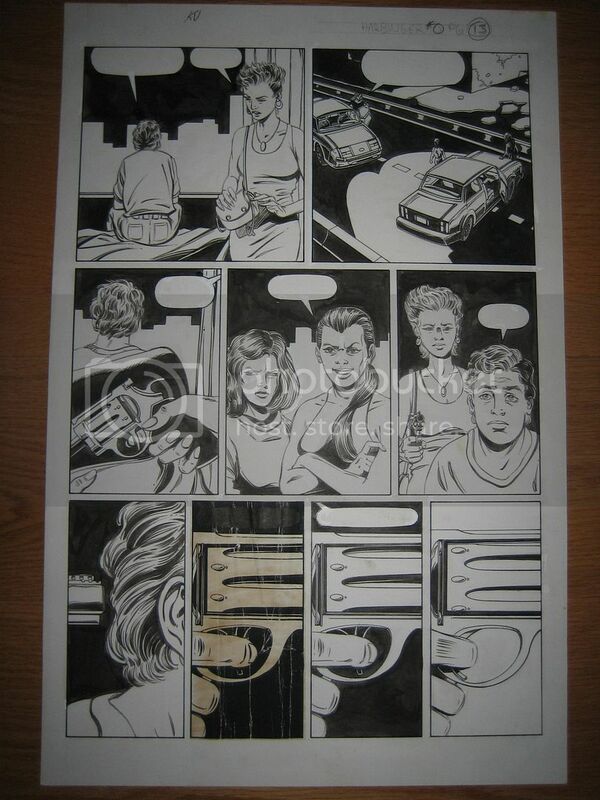 Harbinger #13 page 9. 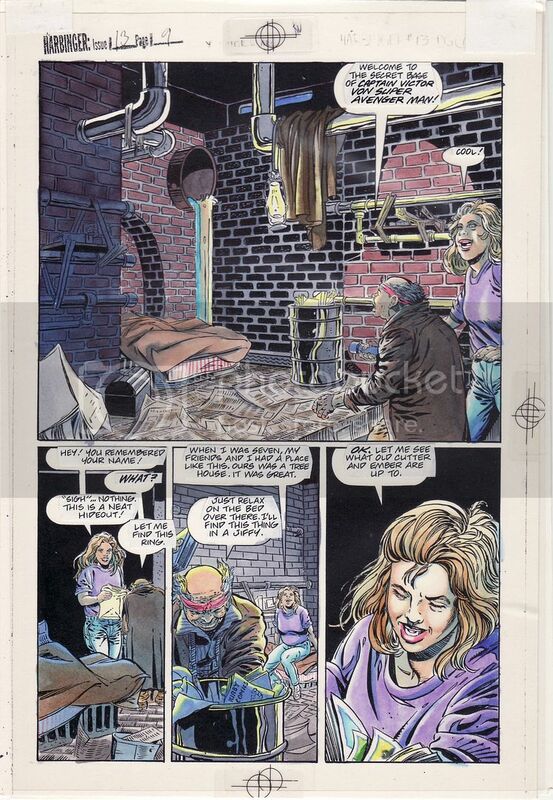 Pencilled by David Lapham, inked by Gonzalo Mayo, and colored by Maurice Fontenot. Harbinger #13 page 11. 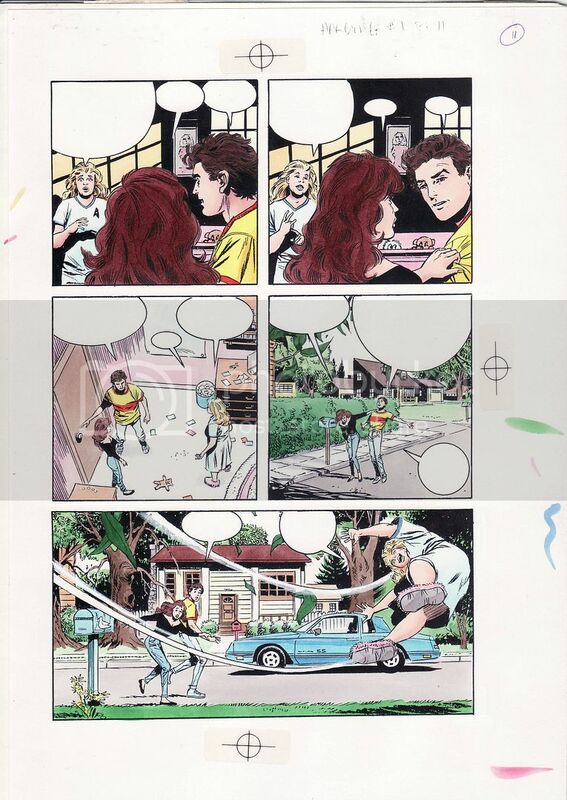 Pencilled by David Lapham, inked by Gonzalo Mayo, and colored by Maurice Fontenot. 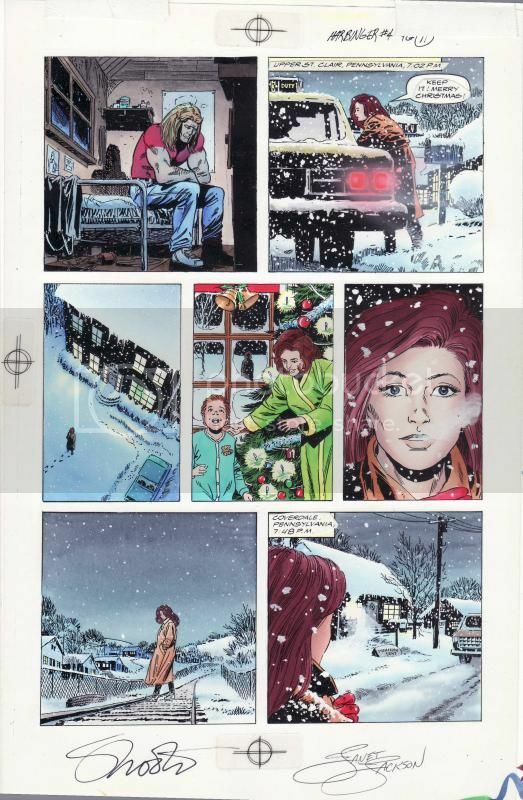 Harbinger #13 page 13. 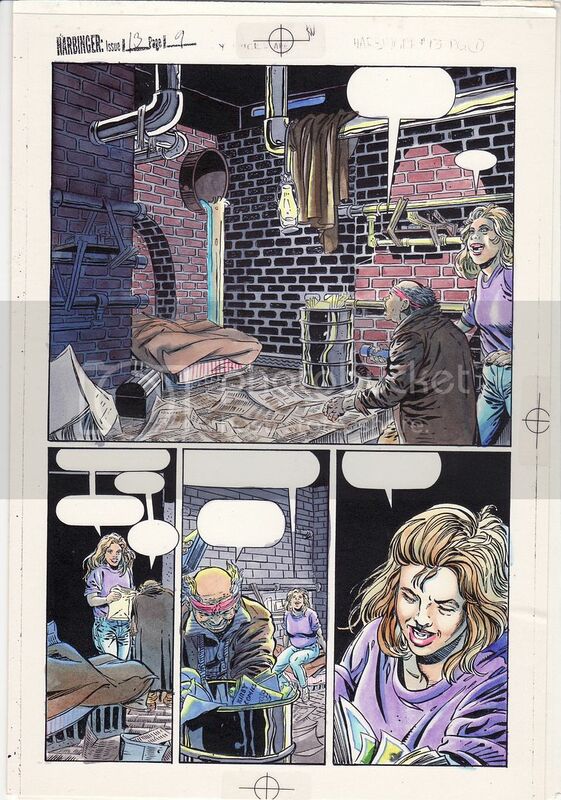 Pencilled by David Lapham, inked by Gonzalo Mayo, and colored by Maurice Fontenot. 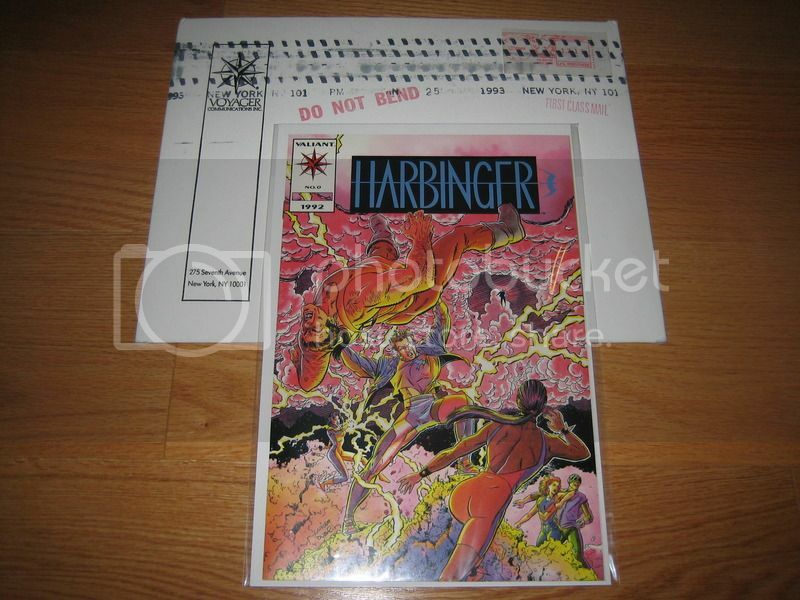 Harbinger #13 page 14. 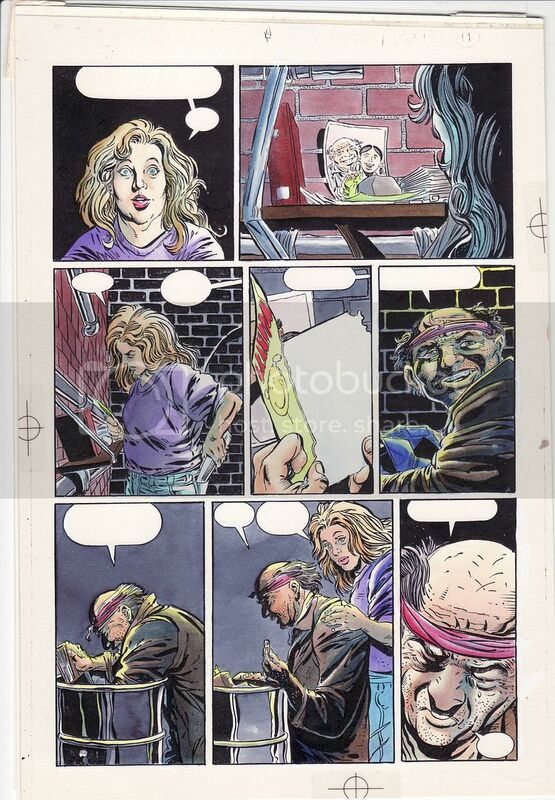 Pencilled by David Lapham, inked by Gonzalo Mayo, and colored by Maurice Fontenot. 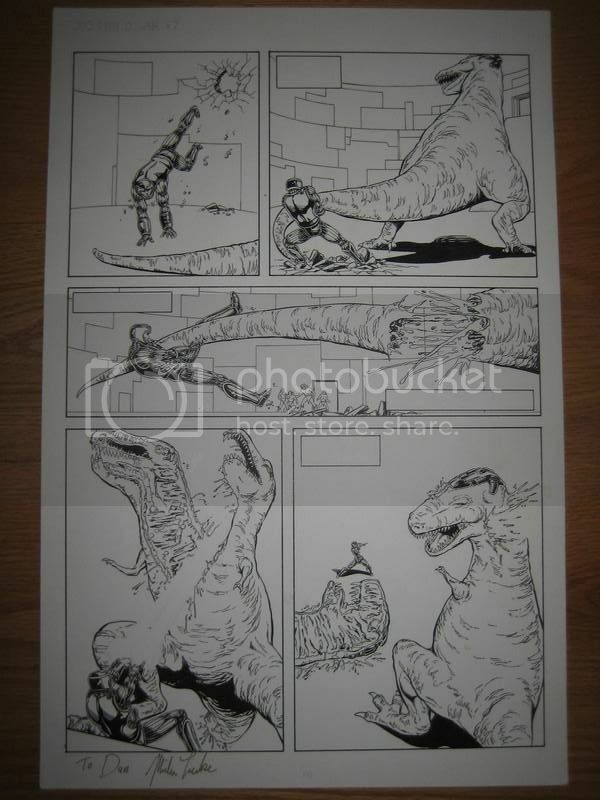 Turok Dinosaur Hunter #34 page 21. 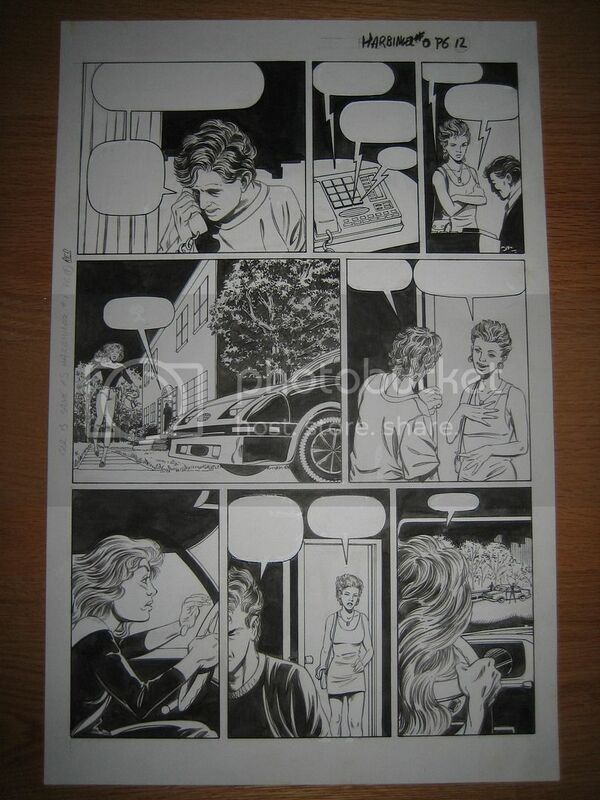 Pencilled by Mozart Couto, inked by Remmy Ribiero. Doctor Tomorrow #7 page 18. 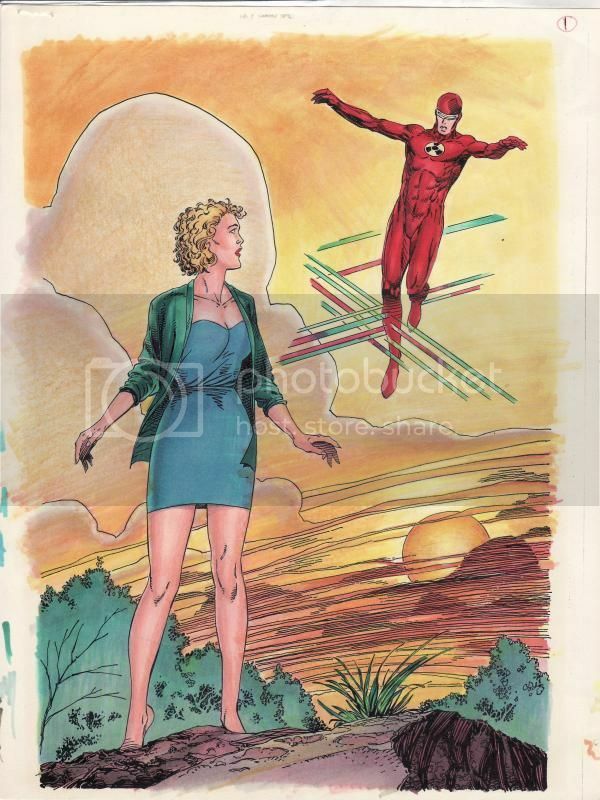 Pencilled by Tom Grindberg, inked by Bill Anderson. 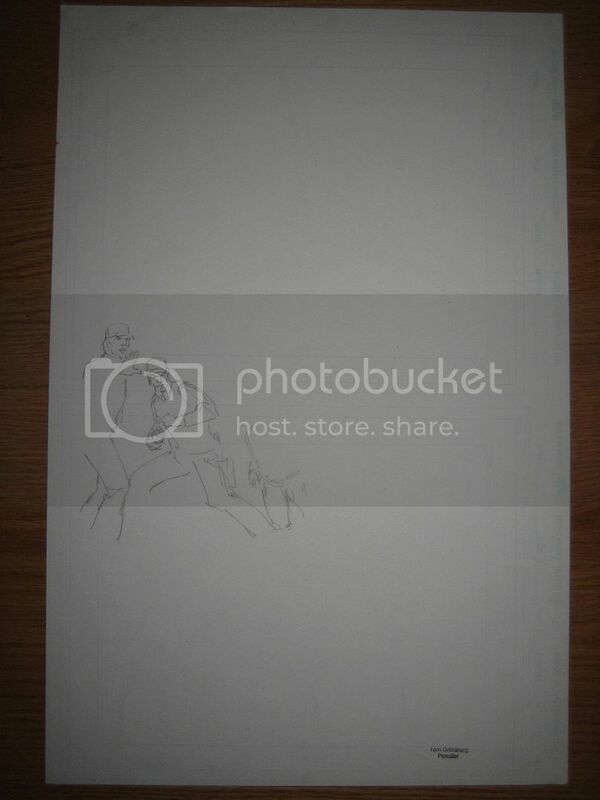 Additional pencil sketch on back. 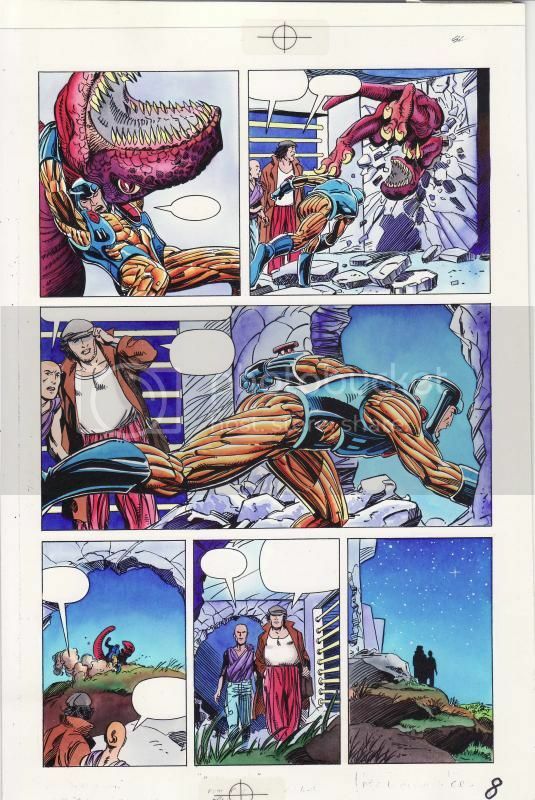 X-O Manowar #7 page 20. 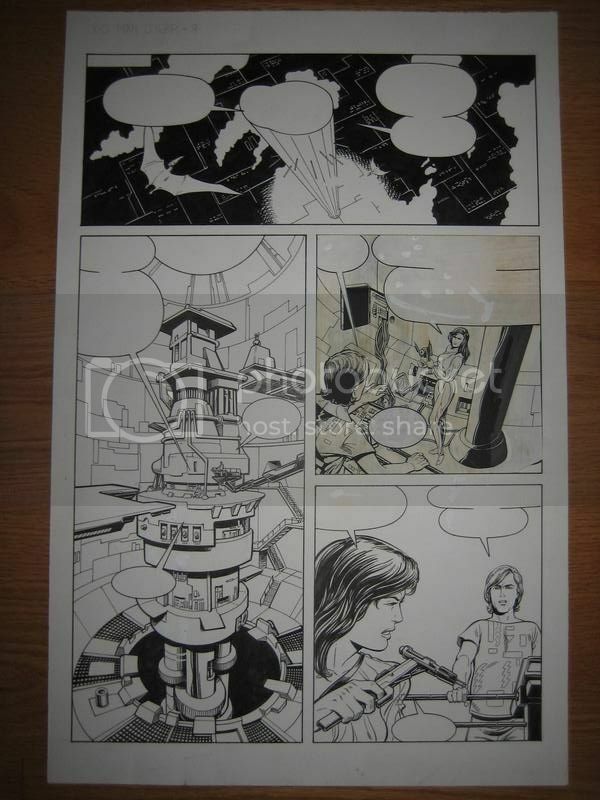 Pencilled by Mike Leeke, inked by Tom Ryder. 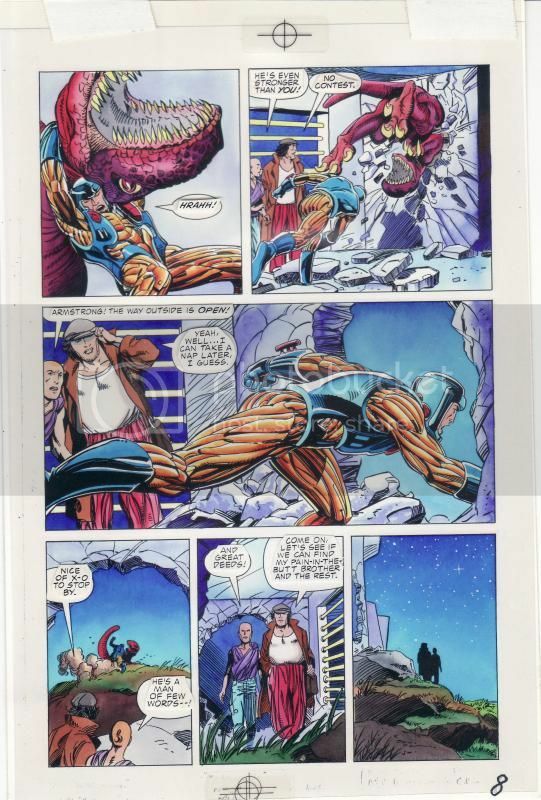 X-O Manowar #8 page 8. 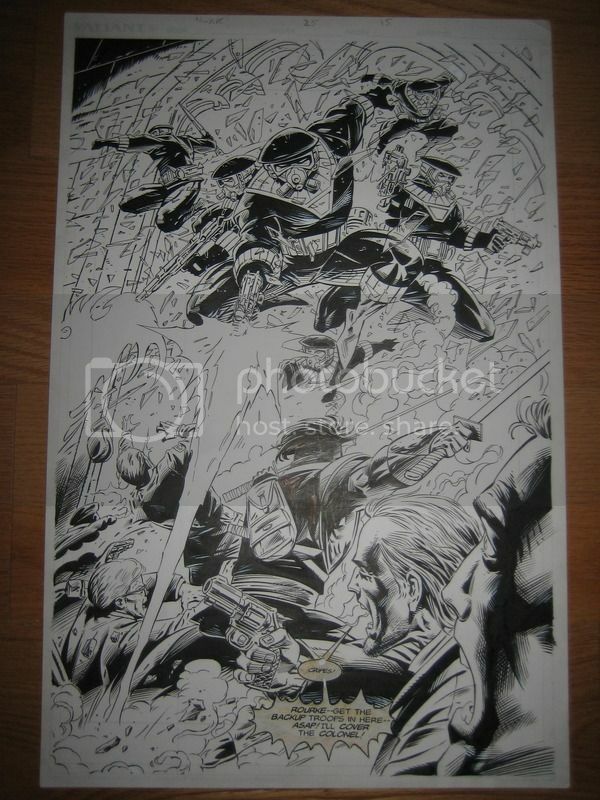 Pencilled by Mike Leeke, inked by Tom Ryder. Additional paste-up for panel 3. Harbinger #13 page 5. Inks and matching colors. 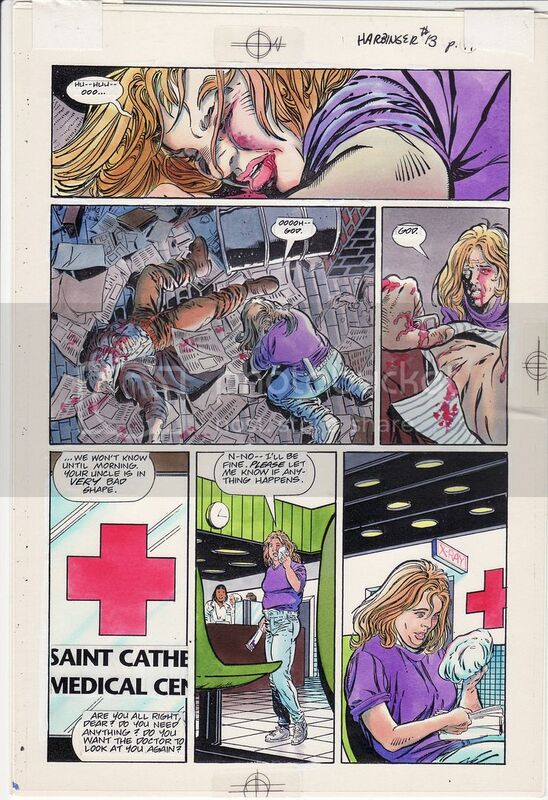 Pencilled by David Lapham, inked by Gonzalo Mayo, and colored by Maurice Fontenot.